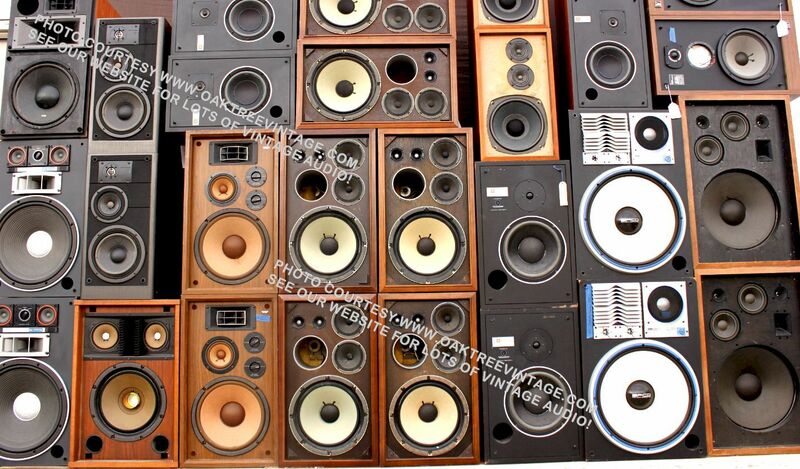 Classic & Vintage Home Audio / Stereo Speakers / Loudspeakers… Ready to GO! Refurbished & Fully Tested. 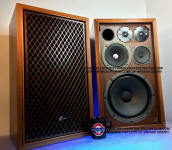 Classic / Vintage Home Audio / Stereo Speakers / Loudspeakers: Refurbished, Pre-owned speakers fully Certified with a warranty! 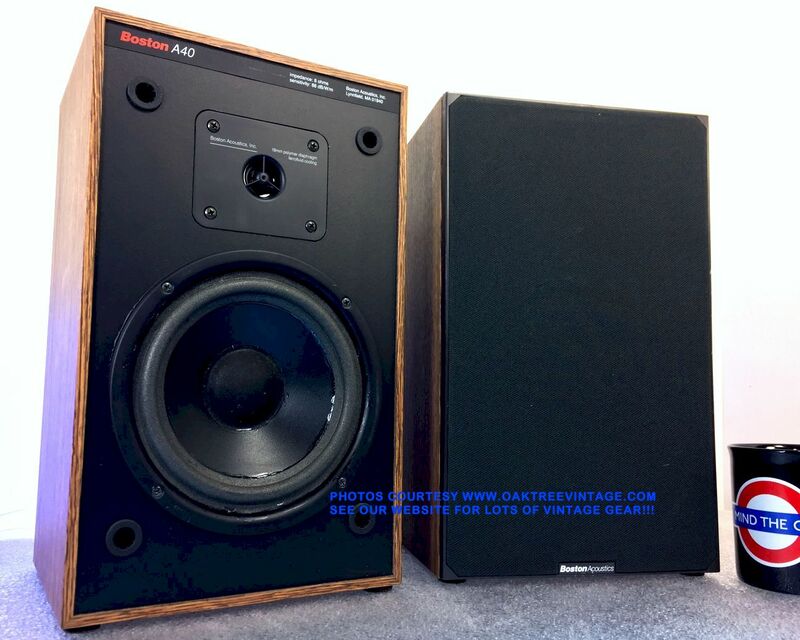 Brands such as ADS, A/D/S, Advent Loudspeakers, AR, Bose, Boston Acoustics, Cerwin Vega / HED, DCM, ESB, EPI, EV, Fisher, Harman Kardon, JBL, Jensen, KEF, Kenwood KL, Klipsch, Infinity SM / RS, MCS, Mission, Paradigm, Pioneer CS / HPM, Polk Audio, PSB, Rectilinear, Sansui SP, Snell Type, Technics SB, Yamaha NS speakers from the 1960's / Sixties, 1970's / Seventies, 1980's / Eighties. Please be patient while page below loads. There's A LOT OF SPEAKERS to see! 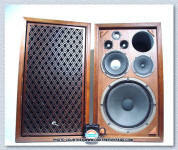 CLASSIC / VINTAGE HOME AUDIO SPEAKERS . . . Unless otherwise noted, speakers include both grills even though only one is typically displayed in photos. 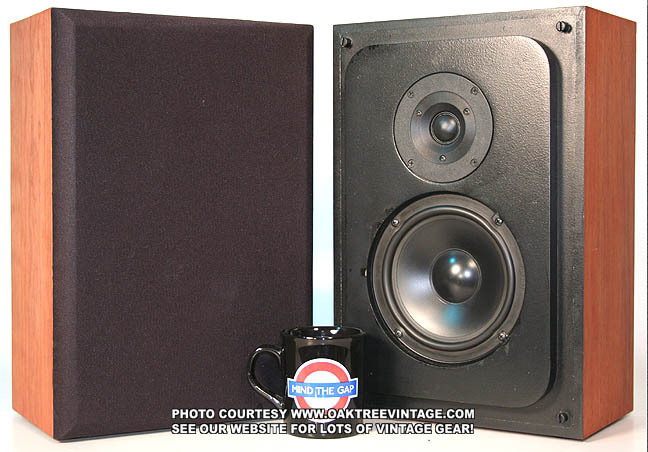 One of the top 'Classics' and one of the most sought after speaker models ever made. 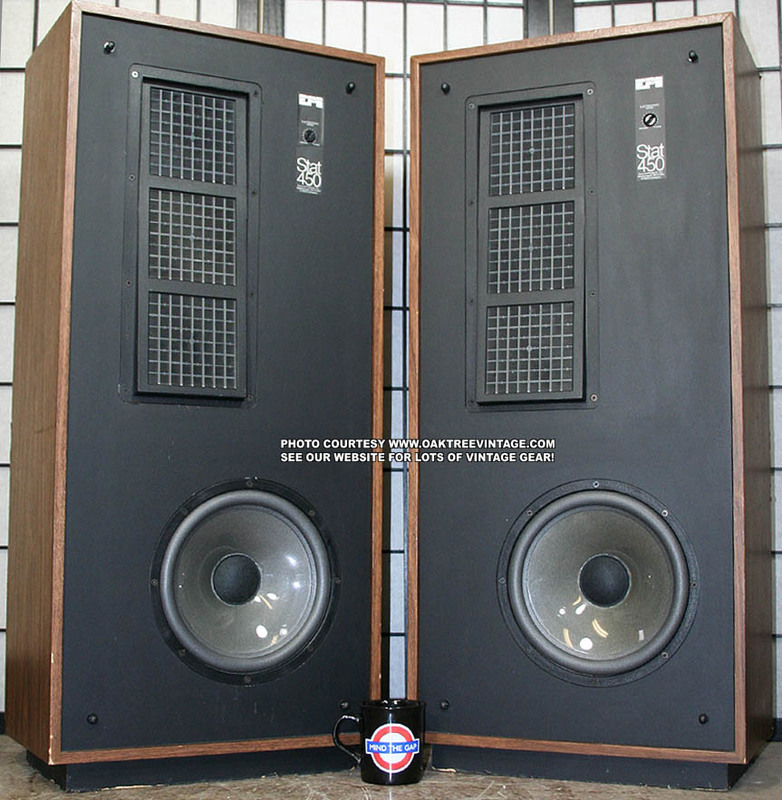 The JBL L100 ‘Century’ speakers. It's hard to expand on what's already been written out there about these speakers. 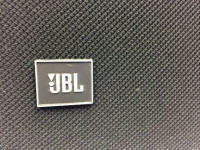 Most fans of these know some version of the JBL L100 story or link to an appreciation web site. They have been one of my favorites for some years now, and I finally just finished a pair for myself to keep as well. They are capable of high volume levels while producing "pounding" & "tight" bass with great balance on the top and mid end. Just a great 'all-around' speaker for home audio listening or recording ‘studio monitor’ use. Just as happy with a medium-small size amp as they are with amps of larger size (probably not efficient enough to enjoy with a small wattage, under 25 Watts or single ended tube amp). Our speaker tech has completely gone through and 'certified' these. Tweeter diffusion foam replaced. All drivers were removed and reinstalled into cabinet with ‘added’ gasketing material under their frames to further reduce any possibilities of vibration or acoustic anomalies. 'High' and 'Mid' Attenuators checked for functionality (these attenuators have wipers that go 'a bit too far', thus go past their coils at 100% rotation, so for 100% signal, adjust to extreme 'clockwise', then back them off 1-2mm). The tweeters have new dispersion foam installed. Grill front frames re-covered and look fabulous (while not shown in the above photos, the "JBL" logo badges are intact on the frames). Next, as always they were tested with both recorded material, PN 20-20k and swept them with our AF generator from 20-3kHz. Then came our standard, 'abusive' test recordings. 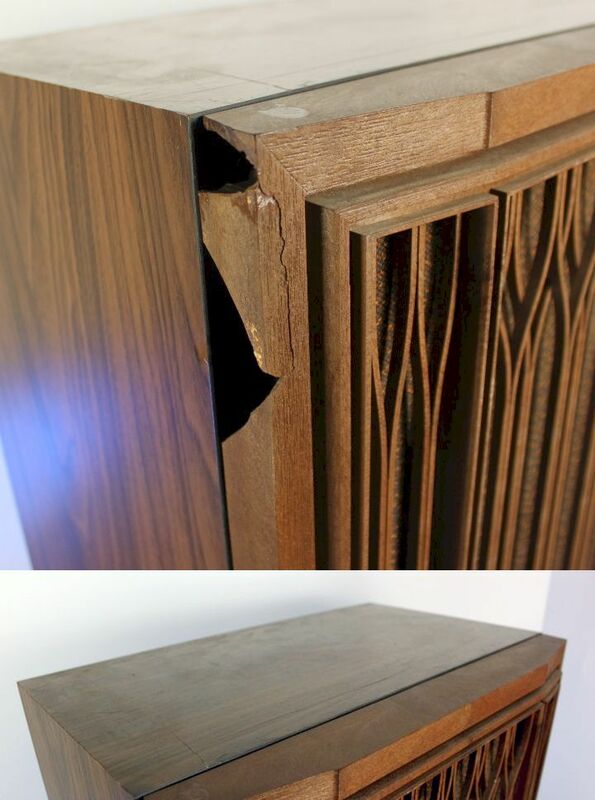 The only cosmetic issue worth mentioning, is that the top of one cabinet appears to have been re-veneered, and does not match the cosmetics of the other cabinet (see photos above & reflected in the price). Other than that the front corners and edges are all nice and crisp with virtually no wear. Cabinets were finished off with a coat of ‘Lemon Oil’ and then hand-rubbed with ‘Feed-n-Wax’. They look GREAT! Following the above work, these speakers are ready to go! We auditioned this pair well. Following the above mentioned 'barrage', our demo cuts ran the gamut from Dire Straits, 'Brothers in Arms', TLC 'Fan Mail', Allison Kraus and Union Station, Nickelback, and a few others, all digitally recorded and some 'DDD'. 'Solid', punchy and 'tight' low-end, with no 'mush'. 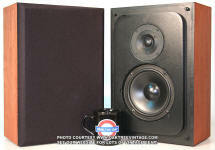 Overall, Great 'tone' quality, but then again, they're one of the most famous and sought after speaker models ever made. Heck, most of the above cuts may have been originally mixed on a pair of these. - 12" / 30cm, JBL 123-A, Die-Cast-aluminum framed, "Ribbed", cone woofer, coated with ‘Lansaplas’, an ‘anti-resonance’ material to reduce radial ‘eddy currents’ (reason for the ‘white’ color), w/ 3”, ‘Edge-wound’ copper ribbon Voice Coil, surrounded by a powerful 6.75 lb ‘AlNiCo V’ magnet. 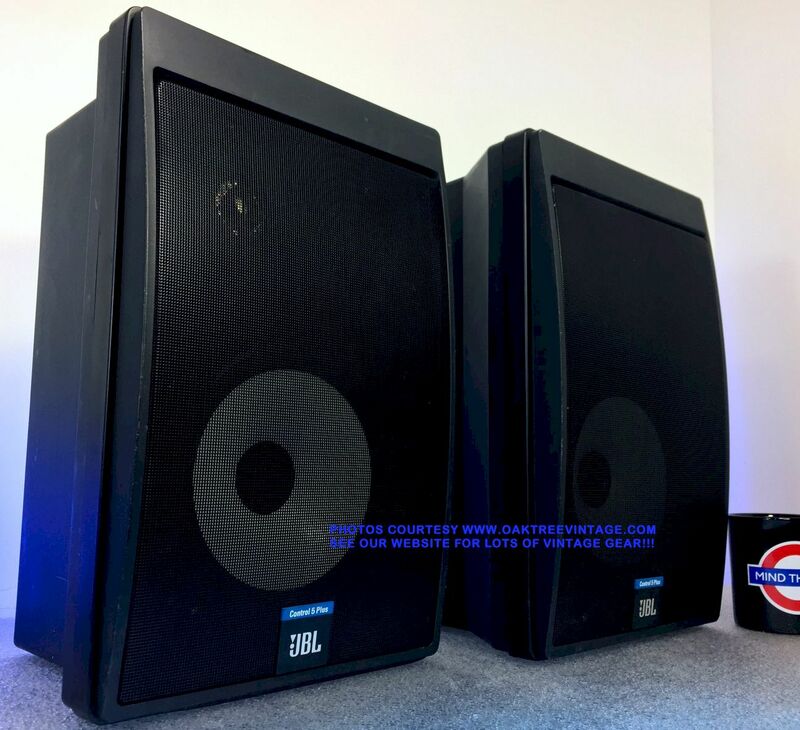 The JBL L100 ‘Centurys’ are from what most folks (including us) would argue was JBL’s 'Pinnacle' period, and were offered in the same line-up that gave us the such great JBL models such as the JBL L26 & L36 ‘Decade’ series speakers, the JBL L300A ‘Summit’ speakers, the JBL L65 ‘Jubal’s’, the JBL L166 ‘Horizon’ speakers, The monstrous JBL Paragon D44000 speakers and of course the industry standard, JBL 4310, 4311 4311B & 4312 studio monitors. Again, we have completely tested all drivers at individually applicable frequencies with a sweep generator looking for any irregular anomalies in either the drivers or cabinet structure integrity. HUGE in SONICS! These are one of the most incredible sounding speakers you will hear. These have most everything we look for in a home audio speaker such as 'balance', detail, power handling, accuracy, punch and 'largeness of sound'. These are in excellent condition as well. Plenty of top end that can be filtered / tailored to your tastes with built-in attenuators. 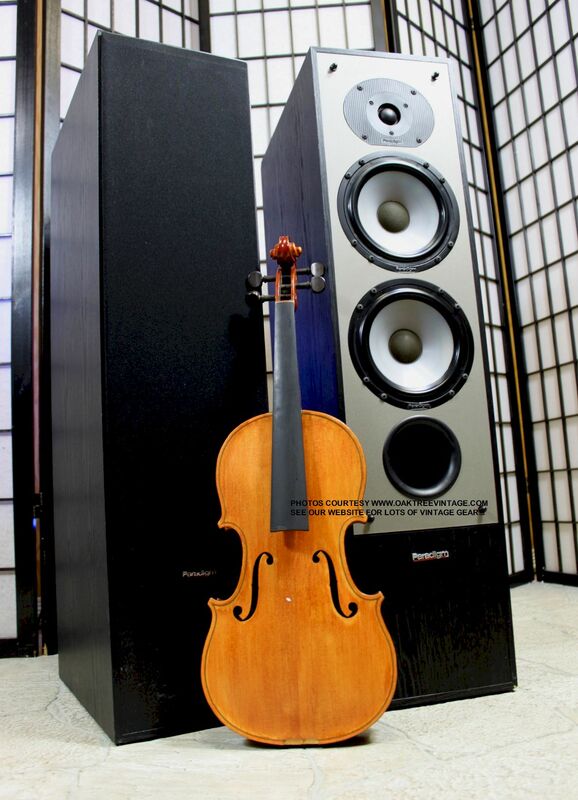 Huge, DEEP low-end that still stays incredibly tight (shakes the concrete floor in our demo room). They are able to handle "power" MUCH better than your average speaker. Not simply referring to they're wattage rating, but just the way the perform at higher power / volume levels without "falling apart" sonically. We 'stood' on them HARD with our test Hafler power amp. 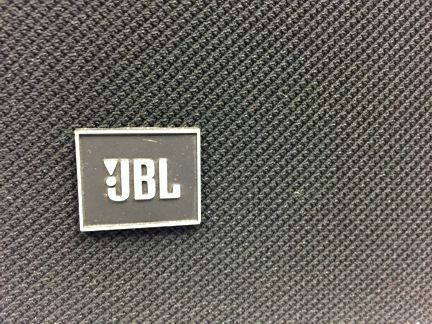 JBL L100’s are always among the top performers of the many speakers we have auditioned over the years. Also, again, these look great having the above mentioned work. JBL L100’s are one of our favorite speakers and for 98% of folks out there, probably one of the most ‘listenable’ speaker you will own for ‘all-around’ music genres and power applications. One of the early 'Classics' from JBL. The JBL Lancer 77 speakers. We have owned these for over a decade, and just recently got around to do their restoration. 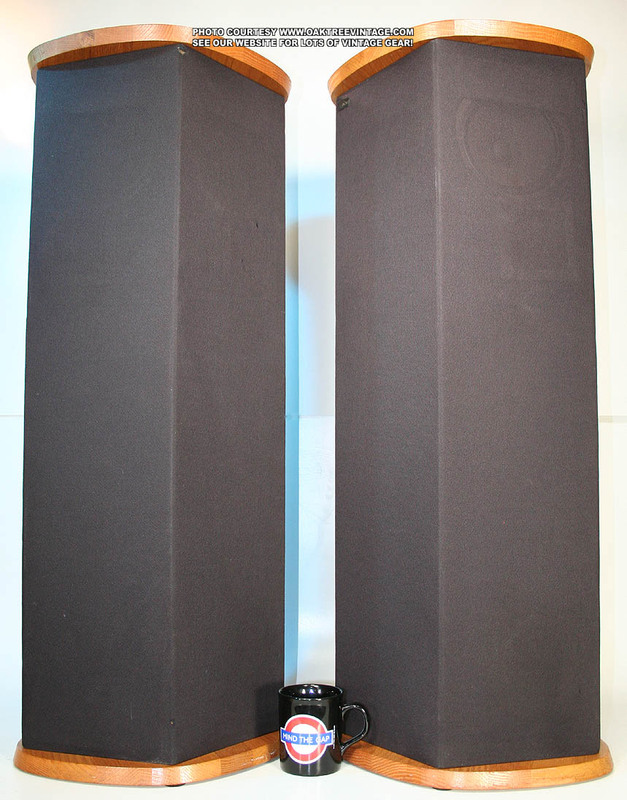 As the 'Lancers' use the JBL LE10 woofer, the surrounds are quite unique compared to most other speaker surrounds. Most speakers that utilize 'foam' surrounds, will need to have their surrounds replaced as it will have deteriorated / fallen apart. The LE10 surrounds do something different. They 'harden' to an extreme degree and essentially limit the woofers excursion to a small degree of it's original travel, which means it will have very little of it's original, intended Bass response (JBL 'Lancer' speakers that are used with their original, 'hardened' Lansaplas surrounds run a strong risk of 'cracking / splitting' the woofer as the VC, if energized with enough power, will try and move the cone, but the cone's movement will be severely restricted by the 'stiff' surrounds. Something's 'gotta' give. Just FYI for anyone reading this that has a pair of Lancers and have not had the surrounds properly replaced, AND are listening to the speakers, under the 'false impression' that they're "working fine". They ARE NOT.). That was not the primary issue. The main issue is finding a speaker tech that is capable of working on not so much the 'narrow' surrounds, but properly conserving the original inverted, oversized, JBL dust caps during the 'shimming process', and not damaging the original Lansaplas coated cone. We convinced a retired JBL warranty tech to temporarily come out of retirement to do these (yes, we have tech's here that are generally perfectly capable of 're-foaming' drivers, but these were the original Lancer 77 Cones with their original, un-adulterated dust caps, so didn't want to take any un-necessary chances). Our speaker tech has completely gone through and 'certified' these. All drivers were removed and reinstalled into cabinet with ‘added’ gasketing material under their frames to further reduce any possibilities of vibration or acoustic anomalies. 'High' Attenuators checked for functionality and work great. Original grills in great shape and the "LANCER 77" logo badges are intact on the frames. Next, as always they were tested with 20-20k PN and swept them with our AF generator from 10Hz-~5kHz. Then came our standard, 'abusive' test recordings. REAL Walnut wood veneer is in amazing shape, not even considering that these are likely 45-50 years old. Cabinets were finished off with a coat of ‘Lemon Oil’ and then hand-rubbed with ‘Feed-n-Wax’. The front corners and edges are all nice and crisp with virtually no wear. About the only cosmetic issue worth noting is that Walnut veneer on one speaker is a bit darker and the other a bit lighter. There's also an old 'moisture' ring on the top of one cabinet, and some medium-light scratches on both, but the Lemon oil pretty well hides it. Overall they look fine. We auditioned this pair well. Following the above mentioned 'barrage', our demo cuts ran the gamut from Dire Straits, 'Brothers in Arms', TLC 'Fan Mail', Allison Kraus and Union Station, Nickelback, and a few others, all digitally recorded and some 'DDD'. They did 'ok' with the rock stuff, but keep reading for where they really excelled. - 10", JBL LE110-A, Die-Cast-aluminum framed, "Ribbed", cone woofer, coated with ‘Lansaplas’, an ‘anti-resonance’ material to reduce radial ‘eddy currents’ (reason for the ‘white’ color), w/ 3”, ‘Edge-wound’ copper ribbon Voice Coil, surrounded by a powerful 6.75 lb ‘AlNiCo V’ magnet. 'Friday Night in San Francisco', with Al Dimeola, John McLaughlin and Paco DeLucia, "Natural, open / airy and LIVE"
JBL Lancer 77’s are always among the top performers of the many speakers we have auditioned over the years for orchestral, classical or jazz. 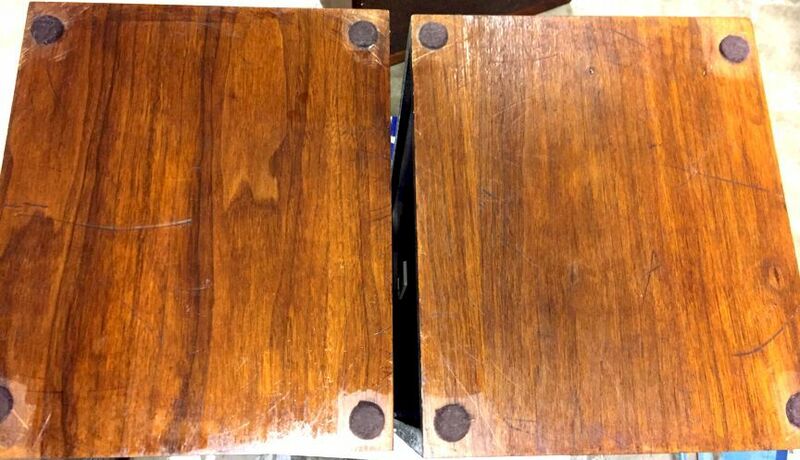 As someone might want to position these on their sides, we have included this shot of the bottoms of the cabinets. Not particularly 'glamorous' as of course they have become scratched / scuffed / gouged over the years, but lemon oil helped immensely. Since we added adhesive, felt feet, we did not oil too closely to the feet so as not to compromise the adhesion of the feet. The feet could be removed, and the entire bottom plate oiled if so desired. ALL THE "OAK TREE VINTAGE MAGIC" INCLUDING FRESH, NEW SURROUNDS AND GASKETING. One of the rarer of the classic Boston Acoustic models. The Boston Acoustic A200 stereo speakers. 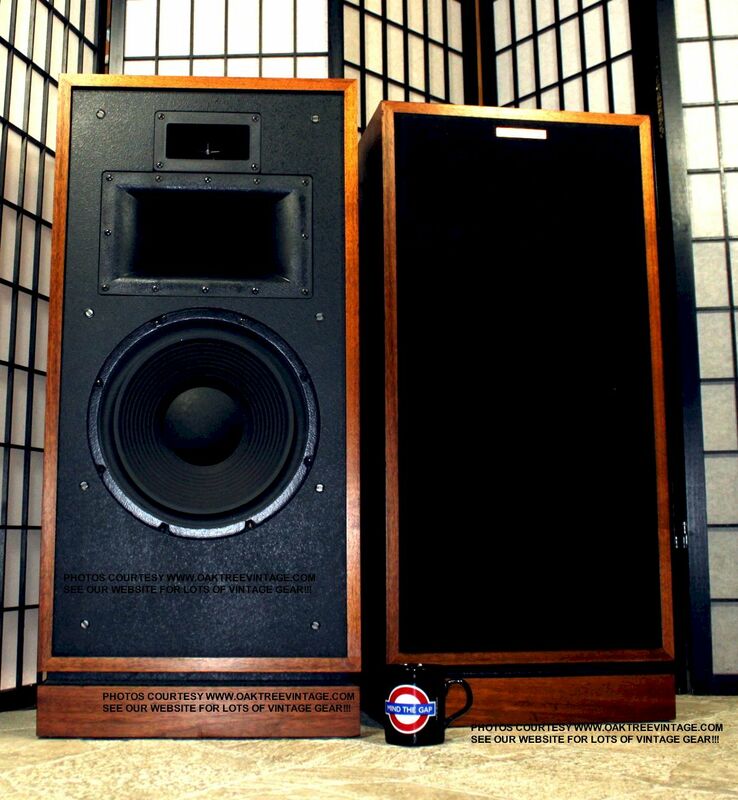 The "200" was the original Boston Speaker when they had 1 (one) model of speaker. Great speaker for detail, balance and that big "wall-o-sound" presence. Our speaker tech has completely gone through and 'Certified' these. He completely tested all drivers. He replaced the 'crushed' original foam gasketing material with new sealant to reduce any possibilities of vibration or acoustic anomalies. He improved the grill 'sandwich' construction to eliminate vibrations and sonic anomalies. The previous owner replaced the original 'skids' with some that are a bit 'beefier'. Felt feet were installed to the bottom plates. Next, as always they were tested with both recorded material, PN 20-20k and swept them with our AF generator from 1Hz-3kHz. Then came our standard, 'abusive' test recordings. 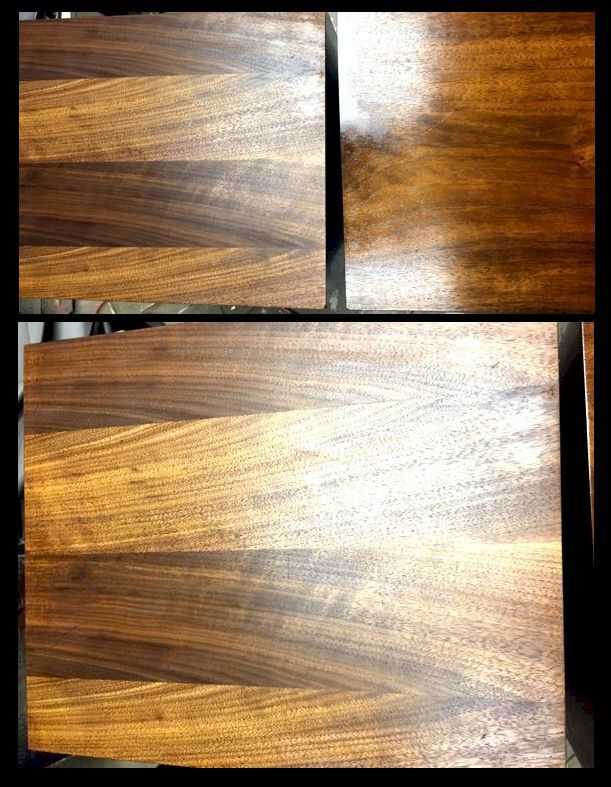 Cosmetically, the grills were cleaned & the cabinets 'real wood' Walnut veneer had a fresh coat of 'Feed-n-Wax' then buffed. The cabs and grills are in great shape. Only cosmetic issue (if you can call it an issue) is slight discoloration around the dust caps on the woofer cones from the solvent reaction with the original glue during the 're-foaming' process. Many speakers will demonstrate the same discoloration to the cones. Cosmetics only, and does not affect performance (technically, this the 'white ring' is an 'indicator' that we are re-foaming speakers 'the correct way', as it means that the dust caps were removed and the voice coils shimmed, which is essentially the only practical way to insure the voice coils are centered in the gap. If you don't see that discoloration, it 'could' mean that the voice coils weren't shimmed during the re-foam job and it was 'done by feel'. Not the most accurate technique and will result in a voice coil and cone not being centered!). (See photos above) These speakers are ready to go! We auditioned this pair extensively and were VERY surprised at their performance. Following the above mentioned 'barrage', our demo cuts ran the gamut from Dire Straits' "So Far Away" from their album 'Brothers in Arms', Donald Fagens, "I.G.Y." from the album "Night Fly", '24K Gold Edition of Jennifer Waren's "Famous Blue Raincoat', TLC's "Scrub" from their album 'Fan Mail' (did 'sub-bass' note @ 1'25" & 1'35" SO SOLIDLY & PROMINENTLY THAT IT SHOOK OUR CONCRETE FLOOR, Allison Kraus and Union Station's Baby, Now That I've Found You", Trapt's 'Headstrong', Don Williams' DDD version of 'Country Boy', Calvin Hampton's, "The Wedding March" from "Digital Pipes, The Splendor of the Organ" a digital recording of a cathedral pipe organ, and a few others, all digitally recorded and some 'DDD'. Very good power handling characteristics. They are able to handle "power" MUCH better than your average speaker. Not simply referring to their wattage rating, but just the way they perform at higher power / volume levels without "falling apart" sonically. We 'stood' on them HARD with our test Hafler 225 Watt power amp (however, at only '9-Oclock' on the volume control, they were already INCREDIBLY LOUD!). 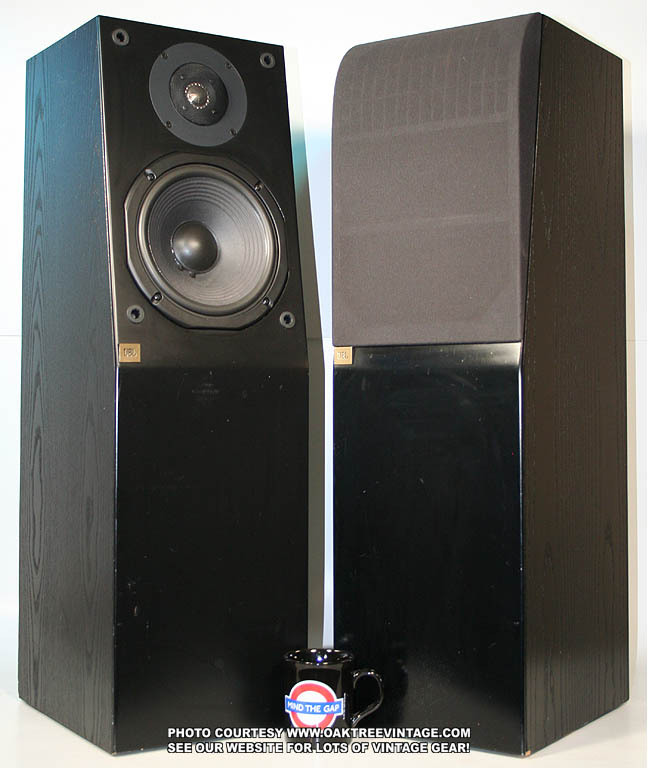 While these speakers are physically large, it is not without reason. Their expansive baffle board serves to reduce any "out of phase" reflections / wave anomalies from neighboring surfaces. This way the speaker can "control" it's sonic results, instead of having it's environment as the major contributor. Secondly, the 'extreme separation' between the woofer and the 'mid-tweeter' section really helps to 'open up' recordings. Prevalent on many recordings such as on Allison Krause's "Baby, Now That I've Found You" to name just one, Thirdly, the tall stature of the A200 puts the tweeter more on plane with your ears, instead of your knees. The real Walnut wood, veneer cabinets are great shape, as are the original black knit grills. Grill frames perfect with not broken or repaired parts. Both woofer surrounds just replaced with new foam for years of trouble-free service. Great speaker for up to mid volume levels. Again, these are more "detail" oriented speakers not "Power Pounding Party" speakers. If that's what you're looking for then don't buy these. 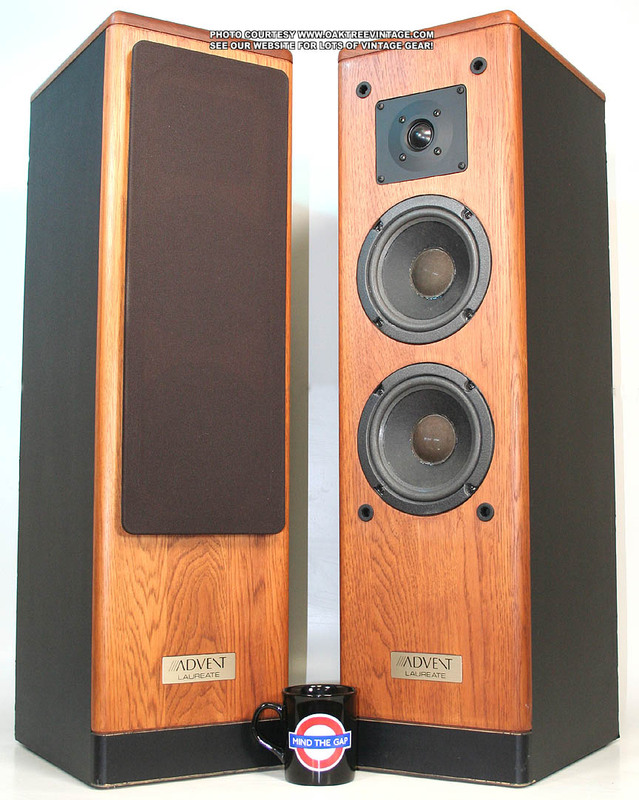 These are "definitive" classic Boston speakers. "TLC "shook the concrete floor", Jen Waren "Famous Blue Raincoat" very natural, tweeter height really makes for great separation and no 'boxy-ness', choir recordings with Carvers 'Sonic Holography' are amazing, 'brash symphonic' pieces are HUGELY reproduced and amazing to listen too, Flute and Piano are natural and realistic, Tyrell Allen and Friends, "Electric Jazz Ensemble" was spectacular, most of the 'Tutti!' CD was BIG AND IN YOUR FACE! peakers really added a 'third dimension' to Allison Krause's "Baby, Now that I've Found You", especially with carvers 'Sonic Holography' engaged. Pipe organ was a bit 'contained'. Most of 'Sheffield Drive' and John Patitucci's CDs were fabulous. Not a great speaker for most of 'Michael Jacksons "Number Ones". Great speaker for jazz and big band. A bit 'smeared' on Nickelback at higher volumes, however 'Trapt' recording 'ROCKED'! with lots of solid punch even at fairly high volume levels, Donald Fagens I.G.Y. perfect 'as expected'. Horn sections and piano sounds VERY NATURAL. Saxophone very realistic. Upright bass natural. Percussion 'Live!!!'. For some reason they seem to overall outperform my personal pair (don't know why, but need to re-evaluate mine)"
If you're looking for "true" wide frequency response, balance and detail then these may be the speaker for you (great for most all types of recordings; R&R, POP, RAP, Jazz and new-country, acoustic guitar recordings & classical / symphonic / string music. Very accurate, detailed sound!!! 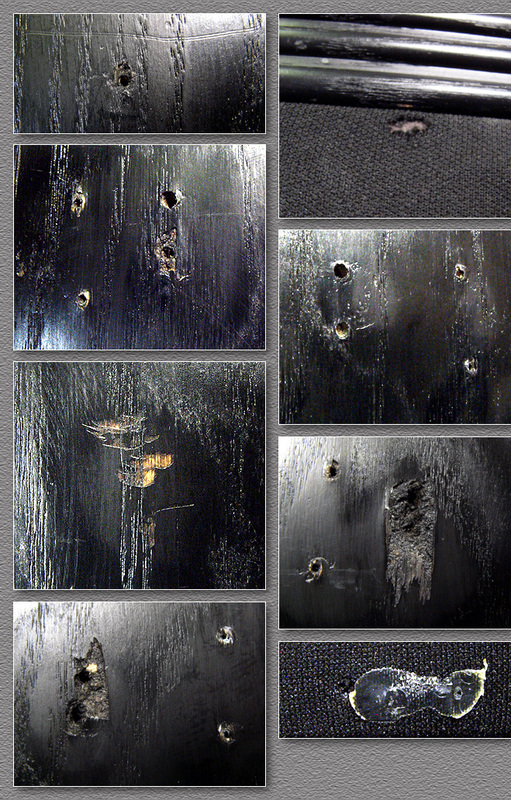 (Note: the close-up of the wood side in the collage photo above, is spot on as far as the hue / color of the actual finish. It's normally very difficult to show the actual color of speakers in photos). Cabinets measure 41.5" H x 21" W x 6.5" D and weighs a hefty 65 lbs each. Includes our standard 90 day limited warranty (excluding problems due to under / over powering). Our speaker tech has completely gone through and 'Certified' these. He completely tested them with both recorded material, PN @ 20-20k and swept them with our AF generator from 12-25,000 Hz and feeding them with the output from our Hafler DH-500 Pro Power Amp, looking for any irregular vibrations / anomalies in either the drivers. driver mounting, crossovers or cabinet structure integrity. We then further auditioned with a myriad of our difficult to reproduce 'test' CD's. They performed and sounded great! The Black Oak, 'wood grained', satin finish cabinets in good shape as are the grills and grill frames. Only cosmetic issues to speak of would be a repaired 'ding' on the rear edge of one cabinet, minor grill cloth snags and some minor 'dimpling' in one of the tweeter domes (cosmetics only). The following is my impression after extensively auditioning the Paradigm 11SE MKIII's. These speakers are all about 'IMAGING' in a definitive 'listening space'. These are especially great speakers if you are a fan of 'modern' Jazz or 'Brass' / 'horn sections' and can afford to have a designated 'sweet spot' listening area. Also great for folk rock and easy rock. If you're a 'rocker', or need 'tunes for your parties' or want speakers to 'passively' listen to from anywhere in the room, then these are NOT the speakers for you. If you appreciate very 'natural' reproduction, especially of 'brass-horns, pianos, jazz drums and percussion, then these speakers will be marvelous! Again, in my opinion, these speakers are best 'on-axis' with the listening area in the 'sweet spot' (if you're not sure what that means, give me a call). - Dual 210mm / 8" Low Frequency Drivers (woofers), Non-deteriorating, Butyl Rubber surrounds, with diecast alloy frames, Polypropylene cones & 1.5" VC's. - 165mm / 6.5" 'Midrange' Frequency Drivers (mids), with diecast alloy frames, Polypropylene cones & 1.5" VC's. From the original Paradigm 11SE MKIII / MK3 brochure, "Paradigm speakers are designed to recreate the 'live music event' in your listening room"..."Natural, Open, Detailed with deep, tight, powerful Bass. Excellent imaging with superb ability to capture the original acoustic space"..."Great...a very high level of performance, excellent bass extension, very real, excellent imaging and can handle lots of power"..."Paradigm's commitment to speaker designs with low distortion, linear response and wide dynamic range meets the challenges of digital technology. The result is reproduction that truly captures the essence, dimension and dynamics of the original musical performance"..."While this outstanding performance enhances 'musical enjoyment', it is equally important for home theater."... "Paradigm speakers in a 'home theater' will have better clarity, imaging and a more seamless soundstage than even the best theaters!" The tall 'tower' stature of the Paradigm 11seMk3 speakers puts the tweeter more on plane with your ears, instead of your knees. Great speaker for up to mid volume levels. Again, these are more "detail" oriented speakers NOT "Power Pounding Party" speakers. If that's what you're looking for then don't buy these. Again as we mentioned earlier, placement of speakers / listener, while most times is important, is imperative with these speakers. If you can afford the space to arrange yourself, in correct proximity to these (between 1 to 2 x d, call me for clarification) you'll be amazed with the 'presence' of these speakers. Great for most Jazz, and percussive jazz, brass / horn section, 'punch, well mixed modern music (think 'YAZ'), 'percussion heavy' selections / music. Very accurate, detailed & 'refined' sound! Comes with an e-copy / pdf of the original Paradigm 11SE MKIII / SE series brochure. Cabinets measure 43.5" H x 11.25" W x 15.5" D and weigh a HEAVY 68 lbs each. Includes our standard 90 day limited warranty (excluding problems due to under / over powering). Our speaker tech has completely gone through and 'Certified' these. We have completely tested all drivers. Original mids' were 'questionable' on the 'audio sweep' so the Midrange's were replaced with a pair of 'originals' we had 'rat-holed' here at Oak Tree Vintage. All drivers were removed and reinstalled into cabinet with ‘added’ gasketing material under their frames to further reduce any possibilities of vibration or acoustic anomalies. Both Mid and Top End attenuators had their contacts burnished and were cleaned internally. Next, as always they were tested with both recorded material, PN 20-20k and swept them with our AF generator from 20-10kHz. Then came our standard, 'abusive' test recordings. We also converted the grills from a 'nailed on' attachment to Velcro and added 'pull-tabs' to facilitate removal (commonly if someone has tried to remove the grills from Rectilinear 'Hi-Boys', the masonite frames will be broken / cracked from being pulled away from the baffle board nails. These were expertly removed, thus are completely intact and un-broken). These speakers are ready to go! From a 1967 Stereo Review Julian Hirsh had this to say about the Rectilinear III, "Over a period of several months, we have had the opportunity to compare it with a number of other speakers that can 'outpoint' the Rectilinear III on any "individual" characteristic-frequency range, smoothness, distortion, efficiency, dispersion or transient response. However, none of the speakers combine ALL of these properties in such desirable proportions as the Rectilinear III", and in a 1972 Stereo Review, he had this to say about the Rectilinear III, "...the two samples we have tested are among the best-sounding and most 'natural' speakers we have heard"
This pair actually has 'Jensen' built 12" woofers from the factory (my personal Rectilinear III-High-Boys do not. Just FYI.) These are great sounding 12" 4-way speakers. All drivers feature a non-deteriorating cloth surrounds. The driver compliment consists of one heavy duty 12" woofer, one 4" midrange with hi-mid whizzer cone, two 2.5" cone tweeters and 2 1/5" cone super tweeters. Bass is enhanced via a 3" tuned port. System input is via binding-post / banana jacks. The input plate also features midrange and hi-freq attenuators, and the "MADE IN THE USA" plate. The entire enclosure is damped with batting. The cabinets are a beautiful American Walnut with very nice grain featured throughout and are in near new condition. These have great efficiency, but are still able to handle bigger power. Huge bass and crystal clear highs with just enough mids. These things ROCK! I know. These are the pair from my personal 'speaker stash / collection'. They measure 35" tall x 18" wide x 12" deep and each weighs 70 lbs unpacked. Comes with an 'e-copy' /pdf download of the Rectilinear Owners manual, as well as a few 'e-copies' of original brochures. Includes our 90 day warranty (excluding problems due to under / over powering)! 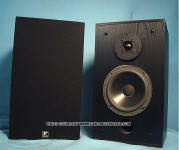 DCM "TIME WINDOW / 1A"
One of most famous of the late '80's thru the mid '90's "audiophile" level stereo speakers. The DCM "Time Window / T-1A" 'Hybrid Transmission Line' speaker. I worked at a DCM dealer for a few years while these were current. We generally sold the lesser "Time Frame 350" models, simply due to the lower price of the "Frames". Most folks only dreamt of the "Windows". I have heard Time Windows on many different amps including Crown DC-300a's, McIntosh MC-30's and 75's, Missions, GAS "Son of Amp-zilla's", just about all the Carvers, Hafler DH-500's, NAD's and many others. Rarely disappointing. I am currently running my personal pair on a Hafler 225. For placement, Time Window's generally like to be along an un-cluttered wall, but these '1A's' are very 'forgiving' and placement is not so critical. While I am not much of a fan of speaking of "critical listening" when it comes to home theater applications, these also work well as "front channel" speakers, but coupling them with most "Class-D", "gutless", modern home theater receivers / amps would be a sacrilege (sorry just had to get that out). Great speaker for detail & balance. These have been completely tested and put through exhaustive paces on our test system. All drivers in great shape and cabinets are structurally sound. One additional 'pro' about this model / pair is that they don't use the 'open cell' foam that is always in some state of deterioration. They use a heavy, black speaker grill knit. The only cosmetic issue is that there's a small hole in the top of one grill and one logo is missing (see above photos). Both just had a fresh coat of lemon oil to the solid, oak wood top and bottom plates. Great speaker for up to mid-high volume levels. Again, these are more "detail" oriented speakers not "Power Pounding Party" speakers. If that's what you're looking for then don't buy these. These are "high definition" speakers (actually more than the previous 2 pair of Time Windows we've had, they do ROCK. Very loud, with good power handling and HUGE volume). If you're looking for "true" wide frequency response, balance and detail then these may be the speaker for you (great for most all types of recordings; R&R, POP, RAP, Jazz and new-country, acoustic guitar recordings & classical / symphonic / string music. Very accurate, detailed sound!!! This is also a consecutively serial numbered pair. Cabinets measure 36" H x 14.75" W x 11.75" D and weighs a hefty 32 lbs each. Includes our standard 90 day limited warranty (excluding problems due to under / over powering. The following is my impression after extensively auditioning the Paradigm 7SE MKIII's. These speakers are much more forgiving one placement than their larger brothers, the 11SE MKIII. I found that almost regardless of placement or proximity to one another, their performance sonics came across as natural, with great balance and detail, with very little limiting effects on each other. These are especially great speakers if you are a fan of 'modern' Jazz or 'Brass' / 'horn sections' and vocally strong selections. Also great for folk rock and easy rock. 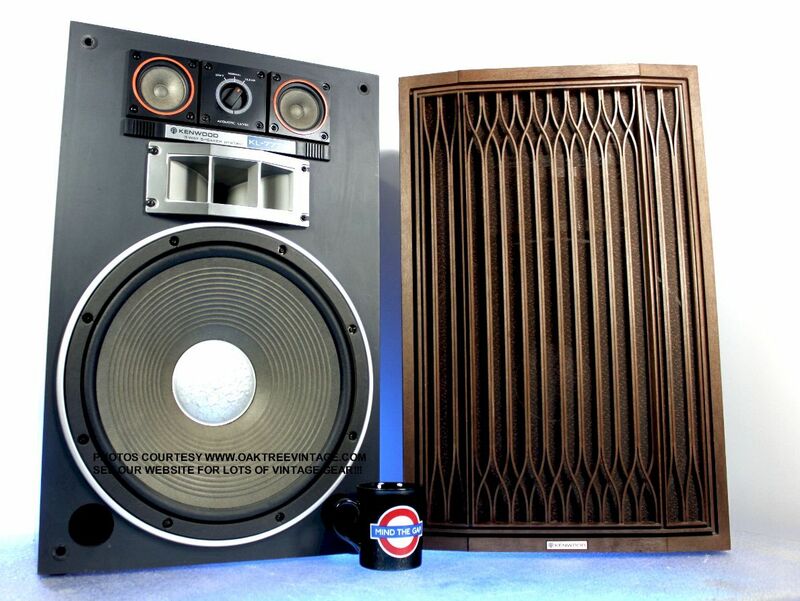 If you're a 'rocker', or need 'tunes for your parties' these are NOT the speakers for you. If you appreciate very 'natural' reproduction, especially of 'brass-horns, pianos, jazz drums and percussion, then these speakers will be marvelous! - Dual 165mm / 6.5" Low Frequency Drivers (woofers), Non-deteriorating, Butyl Rubber surrounds, with die-cast alloy frames, Polypropylene cones & 1.5" VC's. The 7seMk3 exemplifies the idea that strict adherence to the principles of simplicity and finesse in design will result in a product whose performance is second to none at a price with which none can compete". The tall 'tower' stature of the Paradigm 7seMk3 speakers puts the tweeter more on plane with your ears, instead of your knees. Our speaker tech has completely gone through and 'Certified' these. He completely tested them with both recorded material, PN @ 20-20k and swept them with our AF generator from 10Hz-25,000 Hz and feeding them with the output from our Hafler DH-500 Pro Power Amp, looking for any irregular vibrations / anomalies in either the drivers. driver mounting, crossovers or cabinet structure integrity. We then further auditioned with a myriad of our difficult to reproduce 'test' CD's. They performed and sounded great! I spent an inordinate amount of time auditioning these speakers. I tried about every genre of music, including most of the selections listed on our 'Demo Cuts' page but here are some notes I made on their post restoration 'check sheet'; TLC's "Scrub" from their album 'Fan Mail', did 'sub-bass' note @ 1'25" & 1'35" SO SOLIDLY & PROMINENTLY THAT IT SHOOK OUR CONCRETE FLOOR (and that is a 'tell tale' indicator of how most of the rest of the testing would go, and was essentially the same 'low-end' performance we experienced with the largest of this series, the '11se MkIII'), Dire Straits' "So Far Away" from their album 'Brothers in Arms', Donald Fagens, "I.G.Y." from the album "Night Fly" "Was as near perfect as any speaker could do. Good power and 'snap', great balance, and fine WITHOUT an EQ! ", '24K Gold Edition of Jennifer Waren's "Famous Blue Raincoat' allowed her vocals to sound as though she was in the room with me on a 'live sound system', Allison Kraus and Union Station's Baby, Now That I've Found You" '"was very natural and open. 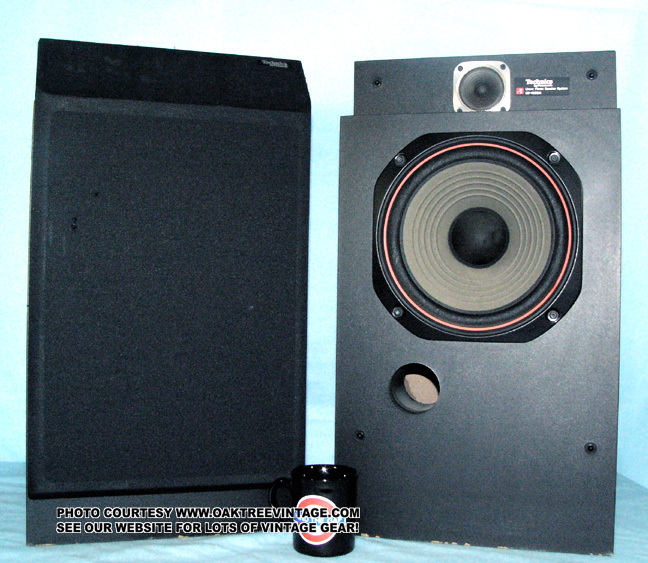 These speakers were also able to separate the bass guitar, acoustic guitar and here vocals VERY well", Don Williams' DDD version of 'Country Boy' 'Was VERY LIVE', Trapt's 'Headstrong', Most of Van Halen’s “1984” and Michael Jackson’s “BAD” all sounded great, but have a limit at about 116dB / 1m. Beyond that you’ll get ‘woofer snap’ (by the way, 116dB is pretty damn loud). Calvin Hampton's, "The Wedding March" from "Digital Pipes, The Splendor of the Organ" a digital recording of a cathedral pipe organ, was "BIG AND OPEN" without any external processing, and a few others, all digitally recorded and some 'DDD'. Decent power handling characteristics. They are able to handle "power" better than your average speaker. Not simply referring to their wattage rating, but just the way they perform at higher power / volume levels without "falling apart" sonically (at least up to about 116dB with some fairly 'strenuous' material). We 'stood' on them to a reasonable degree with our test Hafler 485 Watt power amp. Great for most Jazz, and percussive jazz, brass / horn section, 'punch, well mixed modern music (think 'YAZ'), 'percussion heavy' selections / music. Very accurate, detailed & 'refined' sound! Comes with an e-copy / pdf of the original Paradigm 7SE MKIII / SE series brochure. Cabinets measure 35" H x 8.25" W x 14.75" D and weigh a 39lbs each. Includes our standard 90 day limited warranty (excluding problems due to under / over powering). Classic lattice grill, vintage & large Kenwood KL-777X stereo speakers. 3-Way, 4-Driver, Bass Reflex cabinet design. 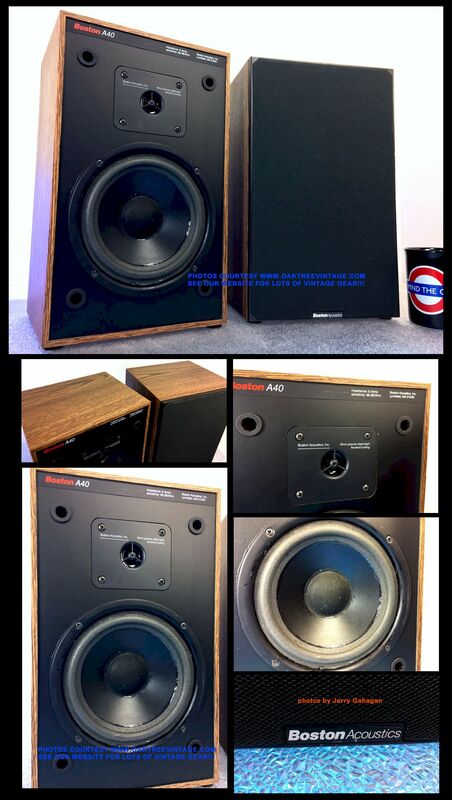 These are VERY efficient speakers with above average tone balance for late '70's speakers. Plenty of top end that can be filtered / tailored to your tastes with built-in attenuator or external EQ / tone control. Also HUGE & tight low end, likely due to the ported and very 'tuned' cabinet design. They also seem to be able to handle "power" better than your average speaker. Not simply referring to they're wattage rating, but just the way the perform at higher power / volume levels without "falling apart" sonically. Our speaker tech has completely gone through and 'Certified' these. - All drivers were removed and tested individually. - Attenuators / L-pads cleaned for 'intermittent free' performance. 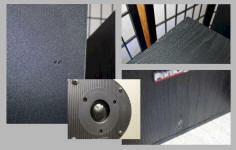 - Poly-Spun batting added to existing damping material to 'tighten up bass response' and reduce cabinet 'ring'. - Gasket / sealant material was added to all driver mounting flanges, prior to re-installation to reduce any possibilities of vibration or acoustic anomalies. Cosmetically, cabinets were cleaned & the wood grain, vinyl wrapped cabinets are in decent shape with typical nicks and scuffs. One of the Poly molded grills has some 'chunks / chips' out of one corner, but other than than, both are in good 'structural' shape (see photos above). Felt feet were installed to the cabinet bottom plates. Next, as always, they were tested with both recorded material, PN 20-20k and swept them with our AF generator from 1Hz-3kHz. Then came our standard, 'issue exposing' and on some levels, 'abusive' test recordings. These speakers are ready to go! We auditioned this pair extensively and 'THEY DELIVERED' as expected, but additionally adding the 'gasketing' really 'tightened' up the cabinets and cleaned up the bass response. The 'bass' is not only solid and tight on these speakers, but goes VERY DEEP. Just about anything from "KORN" ROCKED!!! Van Halens' cut "Drop Dead Legs" from the CD "1984" ROCKED! and a few others, all digitally recorded and some 'DDD'. 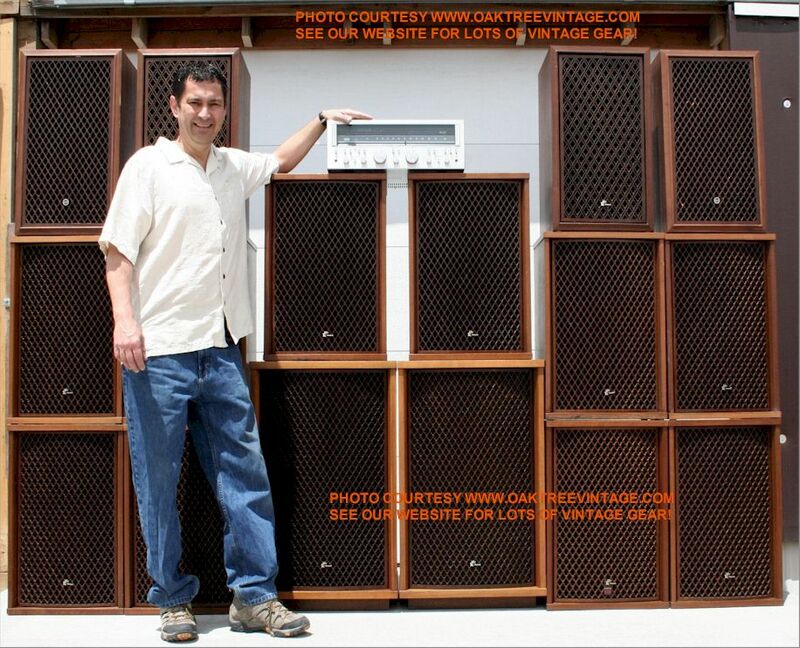 Incredible power handling characteristics for a speaker this size. They are able to handle "power" better MUCH than your average speaker. Not simply referring to their wattage rating, but just the way they perform at higher power / volume levels without "falling apart" sonically. We 'stood' on them HARD with our test Hafler 500 Watt power amplifier. 'Solid', punchy and 'tight' low-end, with no 'mush'. We auditioned this pair extensively and 'THEY DELIVERED' as expected, but additionally adding the 'gasketing' really 'tightened' up the cabinets and cleaned up the bass response. 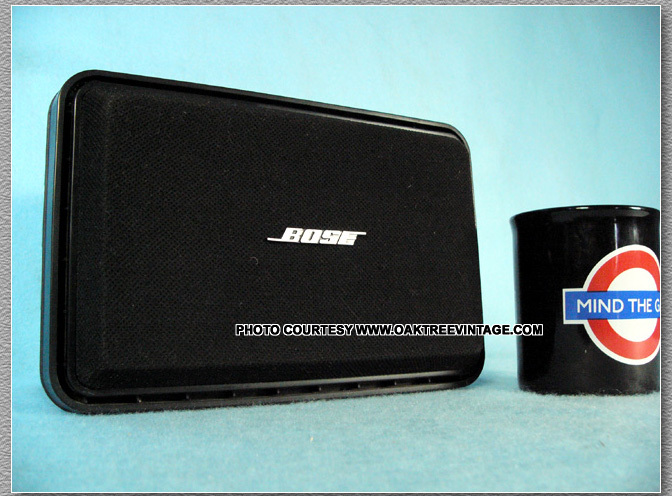 Great sounding speaker for that classic 70's stereo receiver or amplifier! We have completely tested them with both recorded material, PN and swept them with our AF generator. 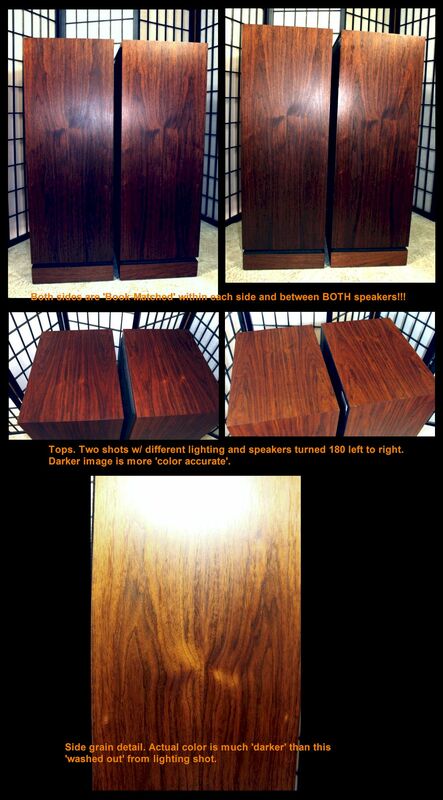 Very nice looking wood grain, vinyl wrap cabinets with only a few, minor 'battle scars'. Again, as stated above, both Poly molded grills in fair shape as one has the 'chips / chunk' from the top corner (see photos above). All drivers are in perfect condition, work and sound fine! Tested for all frequencies with a sweep generator. We aren't typically very interested in A/V style speakers, but these JBL L-3's can hold their own in our 2-channel system. This speaker is large enough, that even though it is a modern, A/V cabinet, it sounds great on an "old skool", 2-channel amp! Great speaker for detail, balance and that big "wall-o-sound" presence. Outrageous 'Low-End' with great response across the spectrum and stay's 'tight'. Handles power well! We have completely tested them with both recorded material, PN 20-20k and swept them with our AF generator. While these speakers are not our typical fare, they are fabulous sounding 2-channel speakers (yes, of course they would sound great in a theater / surround system) By nature, the "tall" stature of the JBL L-3 puts the tweeter more on plane with your ears, instead of your knees. Again, these are fine sounding speakers and are in great condition as well. The original black knit covered, polycarbonate frame grills are in fine shape with no issues and have all their original attachment pins intact. While there is a previous minor repair to one of the woofer edges, they perform flawlessly. The original 'Ash Black' finish over real wood veneer finish is in great condition with only minor, normal wear (see detail photos above). NEW MSRP WAS $980 pr. Jerry Gahagan of Oak Tree Enterprises, LLC in front of one of a few 'batches' of speakers we put together for one of our clients. These speakers are all about 'IMAGING' in a definitive 'listening space'. 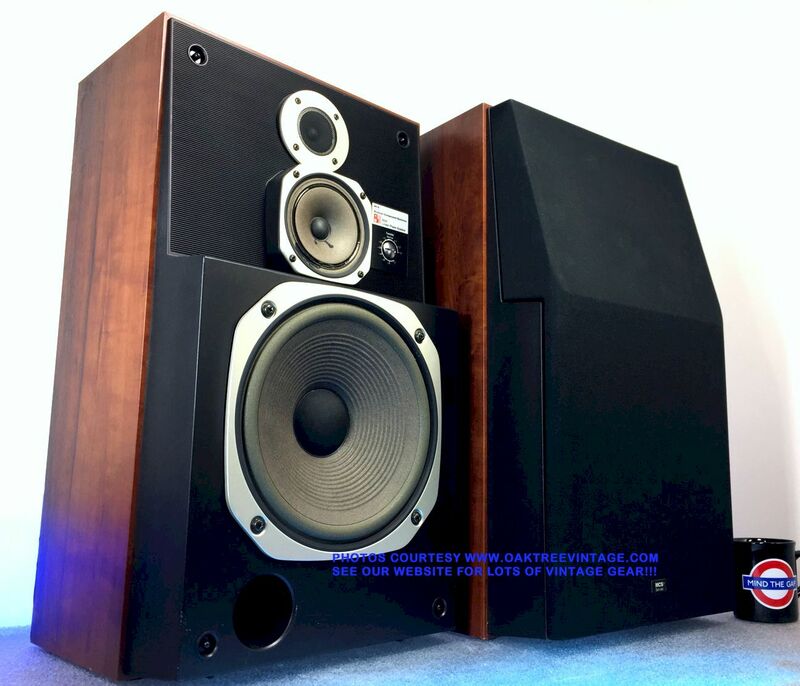 If you are a classical or 'modern' Jazz fan and can afford to have a designated 'sweet spot' listening area, then you'll love these speakers. Also great for folk rock and easy rock. If you're a 'rocker', need 'tunes for your parties' or want speakers to 'passively' listen to from anywhere in the room, then these are NOT the speakers for you. If you appreciate very 'natural' reproduction of vocals, horns (especially sax and clarinet), pianos, jazz drums and percussion, then these speakers will be marvelous! Again, these speakers are best 'on-axis' with the listening area in the 'sweet spot' (if you're not sure what that means, give me a call). The tall 'tower' stature of the Advent Laureate speakers puts the tweeter more on plane with your ears, instead of your knees. Our speaker tech has completely gone through and 'Certified' these. All four woofer surrounds just replaced with new foam for trouble-free service. Following the above work, we completely tested them with both recorded material, PN 20-20k and swept them with our AF generator from 20-5,000 Hz and feeding them with the output from our Hafler P-225 Pro Power Amp, looking for any irregular vibrations / anomalies in either the drivers. driver mounting, crossovers or cabinet structure integrity. We then further auditioned with a myriad of our difficult to reproduce 'test' CD's. Entire cabinet has been frequency swept while being powered by our Hafler test amp. They performed flawlessly and sounded great! Real Pecan wood veneer cabinets in beautiful shape as are the grills and grill frames. Really no cosmetic issues to speak of. Cabinets just had a fresh rub-down w/ lemon oil to bring out their original luster. Great speaker for up to mid volume levels. Again, these are more "detail" oriented speakers NOT "Power Pounding Party" speakers. If that's what you're looking for then don't buy these. These are true to the classic New England speaker sound. Again as we mentioned earlier, placement of speakers / listener, while most times is important, is imperative with these speakers. If you can afford the space to arrange yourself, in correct proximity to these (between 1 to 2 x d, call me for clarification) you'll be amazed with the 'presence' of these speakers. Great for most Jazz, and percussive jazz, acapella vocals, acoustic guitar recordings, blue-grass, gypsy jazz & classical / symphonic / string music. Very accurate, detailed & 'refined' sound! Consecutively serial numbered pair. Cabinets measure 33" H x 9.25" W x 12.5" D and weigh 38 lbs each. Includes our standard 90 day limited warranty (excluding problems due to under / over powering). These speakers are all about 'IMAGING'. One of the rarer of the Epicure speaker models. The Epicure Stat 450 stereo speakers with 'electro-static' tweeters. If you are a 'modern' Jazz fan and can afford to have a designated 'sweet spot' listening area, then you would love these speakers. Fabulous imaging. Also great for folk rock and easy rock. If you're a serious 'rocker', need 'tunes for your parties' or want speakers to 'passively' listen to, then these are NOT the speakers for you. 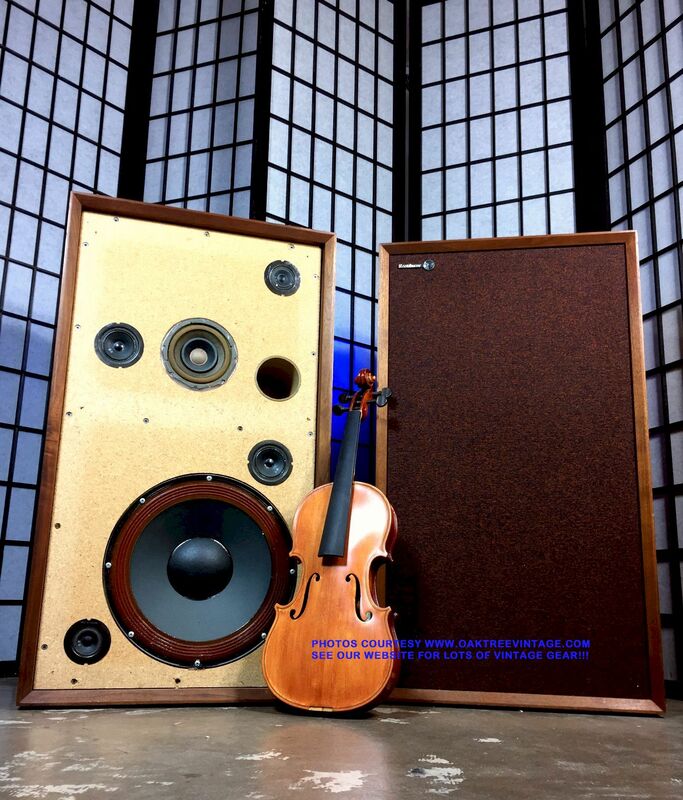 If you appreciate very 'natural' reproduction of vocals, horns (especially sax and clarinet), pianos, jazz drums and percussion, then these speakers will be mesmerizing! Again, these speakers are only effective 'on-axis' with the listening area in the 'sweet spot' (if you're not sure what that means, give me a call). 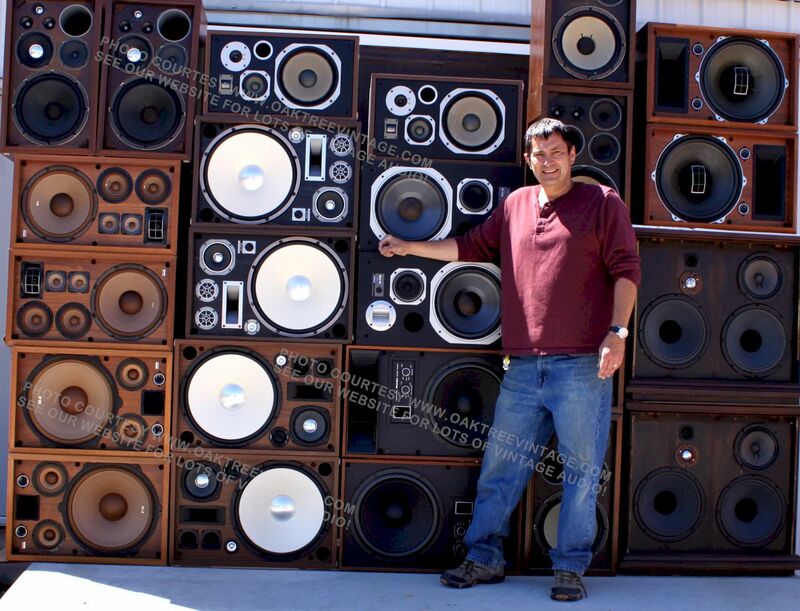 While these speakers are physically large, it is not without reason. Their expansive baffle board serves to reduce any "out of phase" reflections / wave anomalies from neighboring surfaces. This way the speaker can "control" it's sonic results, instead of having it's environment as the major contributor. Secondly the tall stature of the EPI STAT 450 speakers puts the tweeter more on plane with your ears, instead of your knees. Unfortunately these are both missing their grills. The locating / attachment pins are intact, but no grills. With the exception of some normal scuffing to the tops and a few minor 'battle scars', the wood grain, vinyl wrapped cabinets are in good shape. Some wear to the built-in bases (see above photos). Our speaker tech has completely gone through and 'Certified' these. Both woofer surrounds just replaced with new foam for trouble-free service. We also did multiple internal wiring repairs, replaced one of the speaker wire / AC power input panels, added foam to rear of tweeter plate mounting flanges to isolate from the cabinet (should have been done at the factory originally on this model) and added isolation material to the woofer mounting flanges. Following that work and mod's, we completely tested them with both recorded material, PN 20-20k and swept them with our AF generator from 20-5,000 Hz and feeding them with the output from our Hafler P-225 Pro Power Amp, looking for any vibrations or other anomalies (and there were originally a few that we addressed, as there typically are on speakers). Then further auditioned with a myriad of our difficult to reproduce 'test' CD's. Great speaker for up to mid volume levels. Again, these are more "detail" oriented speakers NOT "Power Pounding Party" speakers. If that's what you're looking for then don't buy these. These are true to the classic New England speaker sound. Again as we mentioned earlier, placement of speakers / listener, while most times is important, is imperative with these speakers. If you can afford the space to arrange yourself, in correct proximity to these (between 1 to 2 x d, call me for clarification) you'll be amazed with the 'presence' of these speakers. Great for most Jazz, acapella vocals, acoustic guitar recordings, blue-grass, gypsy jazz & classical / symphonic / string music. Very accurate, detailed & 'refined' sound! Includes AC power adaptors. Cabinets measure 37.5" H x 17.5" W x 10.5" D and weighs a hefty 50 lbs each. Includes our standard 90 day limited warranty (excluding problems due to under / over powering. 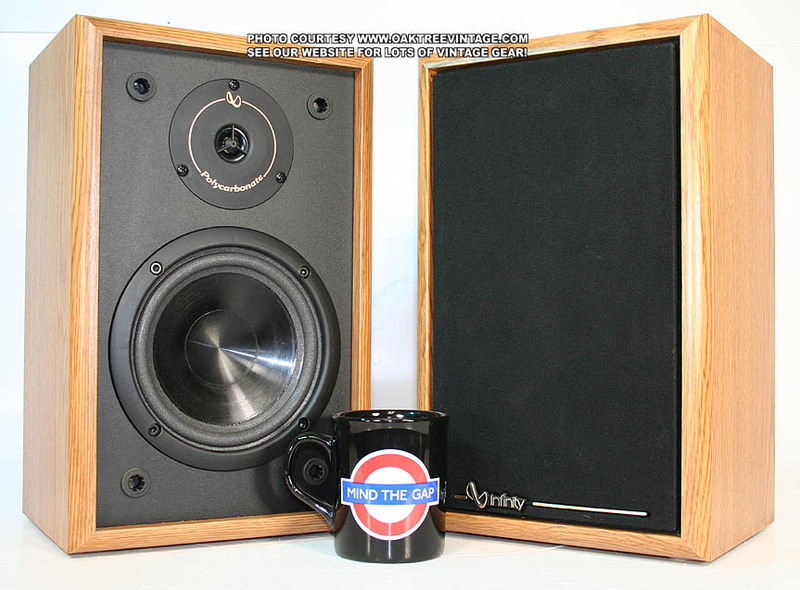 These are great performing speakers for small spaces as reproduction speakers, and also make great "near field monitors" for the project studio. Loaded with Northern Euro drivers, an incredibly well built original crossover and internally wired with 14g wire. 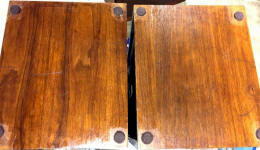 Cosmetically they are in fine condition as they have been professionally 're-veneered' and have a natural 'oil' finish. The speakers have been through our standard, rigorous test procedures and passed with flying colors. Our speaker tech has completely gone through and 'Certified' these. 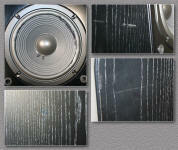 We have completely tested them with both recorded material, PN 20-20k and swept them with our AF generator from 20-5kHz. Much more than your average "satellite" speakers. Also great for small Stereo Systems or for Near Field Studio Monitors. - Dual sets of Banana input jacks that are 'Bi-Amp' capable. Input is via recessed, 3-way, "banana" binding posts! Again, the cabinets have been 'pro' re-veneered in Pecan and stained in a light Cherry, with a natural 'oil' finish. The original black, knit grill cloths also in great shape as well. Great sounding with sonic detail and balance. Great for smaller systems or for surround speakers. These are small "bookshelf" / wall-mount size speakers so their height and foot print is minimal. We have completely tested them including sweeping them with an audio generator looking for any acoustical anomalies or extraneous noises or sounds. They look, work and sound great! Will come with 2 pair of 'Banana' jumpers for running speakers with a normal 'Full-Range' / 2-Channel receiver/amp. Each measures 16" high x 11" wide x 7" deep and weighs 24 lbs unpacked. Includes our standard 90 day limited warranty (excluding problems due to under / over powering. and our philosophy on them. "Are Equalizers really necessary? I just paid $THIRTY GRAND$ for my speakers. They shouldn't need any EQ. Right!??" Short answer is quite probably, maybe-yes, as an EQ will generally be beneficial to many, if not 'most', audio systems. Most speaker designers strive to make a speaker's curve as "flat"* as their projected size parameters and target retail price will allow. The human hearing curve is not "flat". Most folks' hearing is accentuated in the midrange (it's where the human voice is centered) and attenuated in the bass and treble. Sort of a reverse "rock-n-roll smile" curve. When you hear a good, "flat" response speaker, it will likely appear to have, at least for most listeners, an over abundance of mids. It likely will also have a deficiency in bass and possibly treble. It will most likely sound "thin", the degree of which can vary from slight to extreme, depending, on many variables. This might not even be readily apparent when auditioning speakers, but generally if you hear a pair speakers with an appropriately adjusted, EQ engaged, then you listen to it bypassed, you will probably want to re-engage it as quickly as possible. The classic arguments against using an EQ have been that an EQ, or any additional inserted signal processing device, makes the signal path less "pure" and adds noise. Also, again, "these speakers were expensive and shouldn't need an EQ". To address the first point, this issue can usually be reduced to a more than desirable point by utilizing a high quality EQ or signal processor. The noise floor should certainly be below audible levels, and it doesn't take too much of an EQ to achieve that for most folks systems. While the first point is valid, a good EQ's benefits usually far outweigh any minor noise issues, which are probably below most listeners audible limits in the first place. The second issue was answered previously, in the above paragraph. In fact, the better the speakers, the more they would likely benefit from a reduction of the midrange frequencies, due to their as "flat as possible" curve. Again, this would apply to the average persons hearing curve. Some "cheap" speakers, will have a "rock-n-roll smile" EQ curve built-in by utilizing drivers, crossover and cabinet combinations, that have an over abundance of bass and treble, and a deficit of mids by design. That would beg the question of "why wouldn't they all just do that then". The answer to that is that any respectable speaker manufacturer wouldn't try and dictate a built-in curve into a speaker other than as flat as assigned parameters will allow, for a number of reasons. Another less apparent, but still valid reason for utilizing an EQ can be to compensate for listening room acoustic characteristics. This is generally more difficult to assess, but overtime could become a desired need. This need would obviously change with any parameter change in the listening environment. Also, and no offense, but as we age and as we are exposed to various, sometimes, injurious sonic environments and events, our sensitivity to frequency ranges will change. One way to look at a specific speaker / listening environment combination is to think of it as a blank artists canvas. A really high quality speaker system would be comparable to a high quality canvas, brushes and material. Said another way, a "non-flat" EQ curve / listening environment / speaker combination is akin to starting your painting with a dirty, blotchy canvas. The listening environment to a well lit room with natural lighting, conducive to a creative mood. Until you "shape" the EQ, there is no painting on the blank canvas. Once you shape the EQ to your tastes, in a way that compliments the speaker design / room combination, you have created your work of art. While I can appreciate all the arguments for not using an EQ, in the end, I generally use an EQ with it's curve slightly boosted in the bass and treble frequencies and attenuated through the mid frequencies from "Zero" position (the "rock-n-roll smile" curve). It will usually require adjustment following any change in speakers, listening environment parameter adjustments and with the material I am listening too. I also have a 1/3 octave RTA monitor / spectrum analyzer with a pink noise generator and analyzing mic to establish an accurate "flat" point to start from. * Contrary to a somewhat common misconception, "Flat" does not mean "dull". "Flat" refers to the graphic "curve" of a speakers output when analyzed by a spectrum analyzer. Ideally a speaker should be able to reproduce the human hearing range with all frequencies as close to "zero" (even amplitude or "flat") as is practical for the intended design / price point levels. The listener can then modify it from there by various methods (usually some sort of signal processor such as an EQ) to their tastes. We aren't typically very interested in A/V speakers, but these Yamaha YST-A755's can hold their own in our 2-channel system. This speaker is large enough, that even though it is a modern, A/V cabinet, it sounds great on an "old skool", 2-channel amp! Great speaker for detail, balance and that big "wall-o-sound" presence. Handles power VERY WELL! While these speakers are not our typical fare, they are great sounding 2-channel speakers (yes, of course they would sound great in a theater / surround system) By nature, the "tall" stature of the Yamaha YST-A755 puts the tweeter more on plane with your ears, instead of your knees. These are some what "cosmetically challenged" up close, but nothing too distracting. 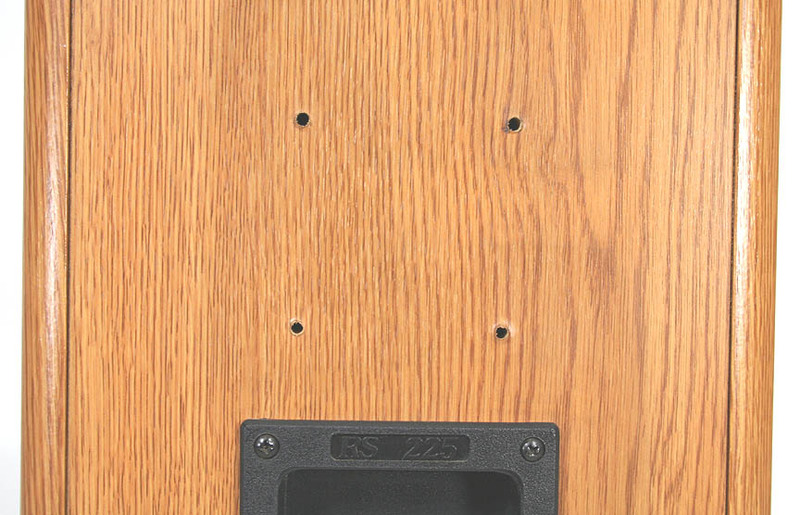 One of the cabinets had some wall mounting brackets bolted in to it so it has a few small holes and both speakers have a few minor scuffs to the satin black, wood grain finish. The original black knit grills are in good shape with a few very minor snags and one is missing the "Yamaha" logo (see far right photos above. The photos were taken at close range with a flash and make the blemishes look very much more noticeable then they are in reality). Grill frames perfect with no broken or repaired parts. Again, both woofer surrounds freshly replaced for years of trouble-free service. Great speaker for up to fairly high volume levels. These are "detail" oriented speakers that can also get loud and fill a room. Great for about any type of music. We tested them extensively and have temporarily added them to our audition line-up because we were so impressed. If you're looking for "true" wide frequency response, balance and detail and a speaker that can handle power well too, then these may be the speaker for you. They ROCK!!! This would be a great speaker for a room with limited space, but you need to get loud as the cabinet has a lot of cubic volume, but with a small "foot print". Cabinets measure 33" H x 10" W x 11"D and weigh a hefty 39 lbs each. Includes our standard 90 day limited warranty (excluding problems due to under / over powering). 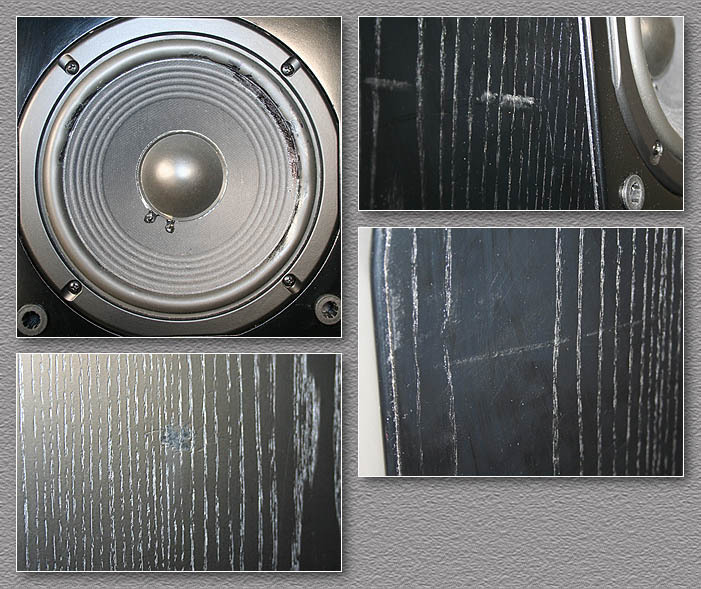 These are from an upper-end line of speakers that Technics produced for a short time. The "Linear Motion" line used a bi-planar baffle board design to more correctly "time align" the two drivers. Our speaker tech has completely gone through and 'Certified' these. We have completely tested them with both recorded material, PN 20-20k and swept them with our AF generator. Great looking, performing and sounding JBL 2-way speakers. While great for home use or project studio monitors, they're geared toward being situated in environments that can be 'harsher' than your living room, but still deliver great, full-range and detailed sonics. Handles power well (check their 175 Watt rating). 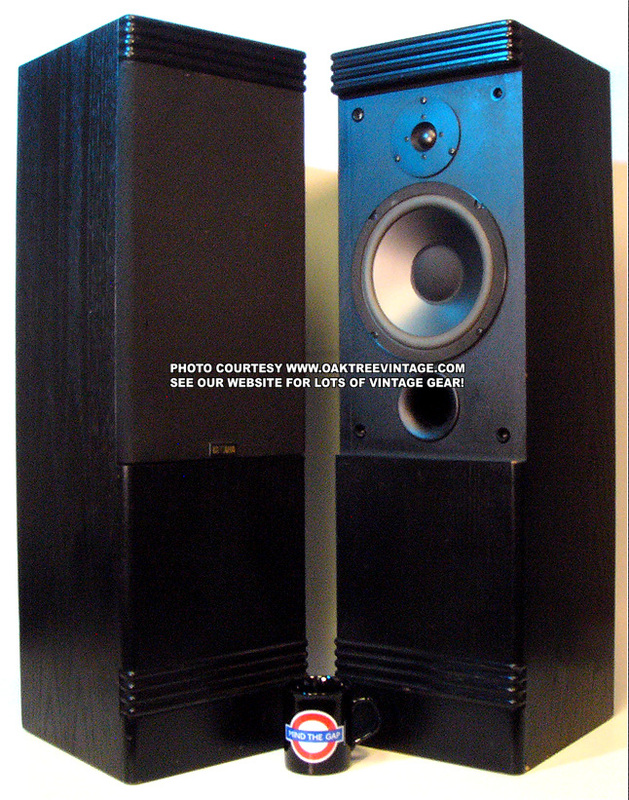 This is a "Mirror Imaged" pair, meaning that in a 'stereo' arrangement or 'near-field' situation, the tweeters can either be situated to the 'outside edges' of the speakers, or the 'inside edges' for a perfectly even distribution of sonics. From the original JBL Control 5 brochure, "The Control 5TM is a high performance, wide range control monitor suitable for use as the primary sound source in a variety of applications. Smooth, extended frequency response combines with wide dynamic capabilities to provide acoustic performance that makes the Control 5 ideal for recording studios, audio-video control rooms, remote trucks and broadcast studios. Clean, functional visual design makes the Control 5 also ideal for foreground music systems, moderate level sound reinforcement, discotheques and music playback systems....The dividing network incorporates protection circuitry to prevent system damage and utilizes high quality components including bypass capacitors for outstanding transient accuracy." 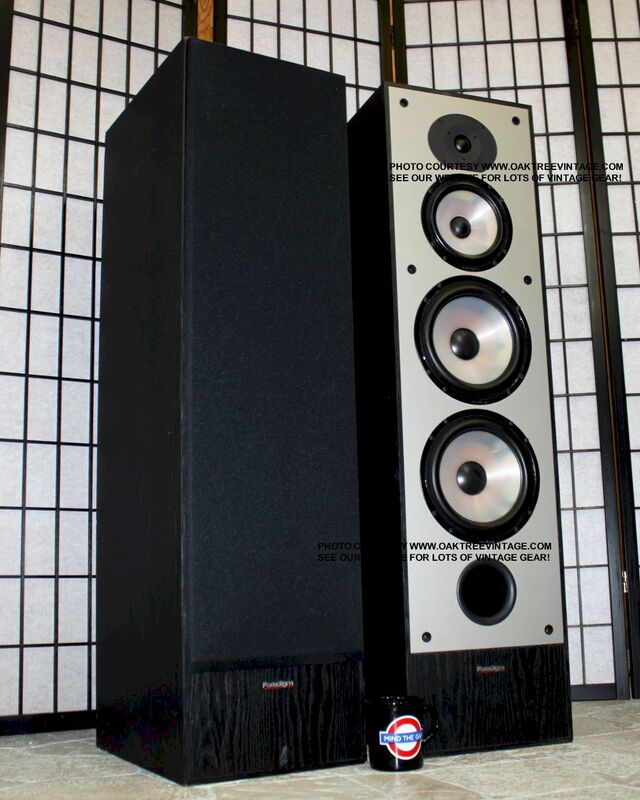 These are great performing 2-way monitors by JBL, the model HLS610. "Dynamite in a small package" sound! Very accurate, detailed sound. Great balance from the 6.5" bottom-end driver coupled with the rear located, tuned port. Top-end is sparkling from the Titanium tweeter. 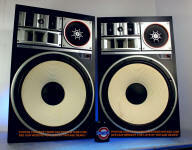 Would be great as home audio speakers, as project studio monitors or as front or rear channel surround sound speakers. From JBL's web site: "For precise delivery of pinpoint imaging throughout a larger "sweet spot," the JBL HLS Series is designed with a Constant-Directivity Horn. This advanced technology greatly improves the sound, anywhere in the room. Co-injection molded woofers and poly-dome tweeters result in deeper lows and smoother highs, both with minimal distortion. 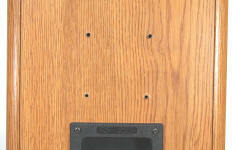 Video Shielding allows speakers to be safely placed near a TV without distorting your television's picture. The result is a crisp, clear, moving sound." 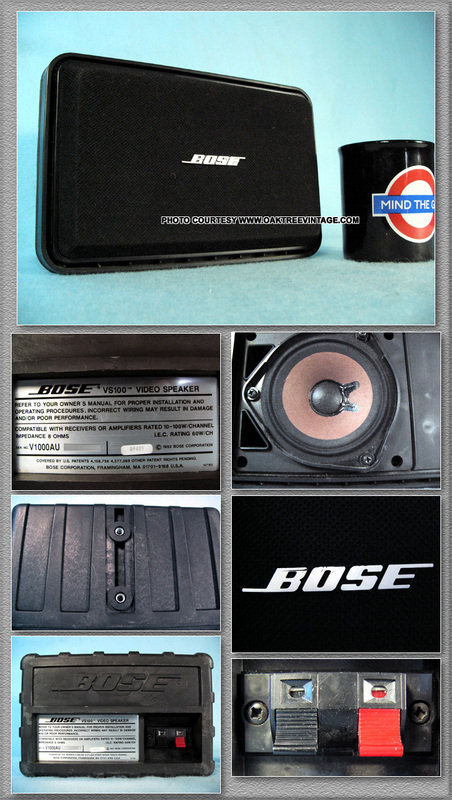 - A "Real" and very well built, internal crossover, not just a cap on the tweeter, so the woofer gets "just lows"! These are consecutively serial numbered speakers. Very solidly built cabinets, finished in satin black. Grills are black knit on contoured frames. The cabinets that are in great shape with normal wear. Great sounding with sonic detail and balance. Great for smaller systems or for surround speakers. These are small "bookshelf" / wall-mount size speakers so their height and foot print is minimal. We have completely tested them including sweeping them with an audio generator looking for any acoustical anomalies or extraneous noises or sounds. They look, work and sound great! Made in USA! Each measures 16.25" high x 8.5" wide x 9.5" deep and weighs 14 lbs unpacked. Includes our standard 90 day limited warranty (excluding problems due to under / over powering. 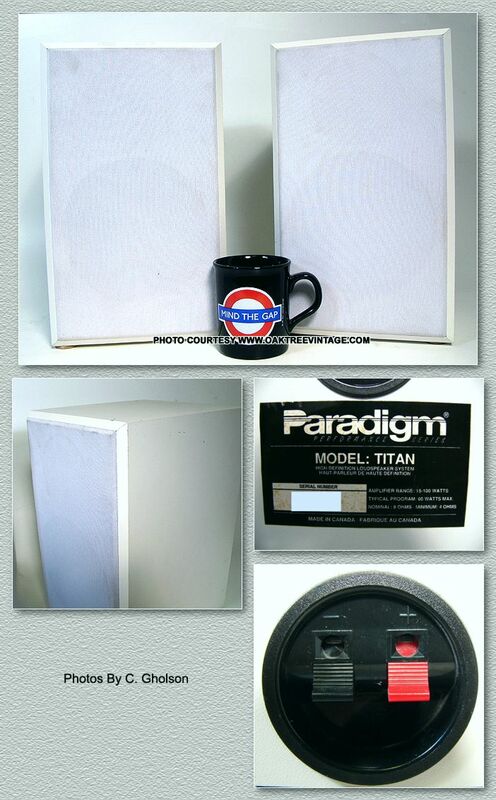 These are great performing, Paradigm "Titan", 2-way speakers. "Dynamite in a small package" sound! Our speaker tech has completely gone through and 'Certified' these. We have completely checked and tested these, including sweeping with our AF generator from 20-5,000 Hz and feeding the output from our Hafler P-225 Pro Power Amp. Only issue is cosmetic and it is that the finish is obviously "white" and they have some "handling" smudges on them. 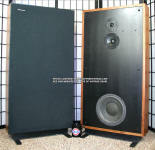 Max Power: 60 Watts peak "program power"
These are consecutively serial numbered speakers. Input is via recessed, spring clips. Very solidly built cabinets, finished in white, vinyl laminate. Grills are white knit. The cabinets that are in great shape, however the grills have some smudges on them that we have not attempted to clean further than what is shown in photos. Great sounding with sonic detail and balance. Great for smaller systems or for surround speakers. These are small "bookshelf" / wall-mount size speakers so their height and foot print is minimal. We have completely tested them including sweeping them with an audio generator looking for any acoustical anomalies or extraneous noises or sounds. They look, work and sound great! Made in Canada! Each measures 13.5" high x 7.75" wide at the front x 9.5" deep and weighs 8 lbs unpacked. Includes our standard 90 day limited warranty (excluding problems due to under / over powering. Great looking, performing and sounding Yamaha NS-A738 3-way speakers have a room filling, "tight" sound that ensures sonic accuracy. 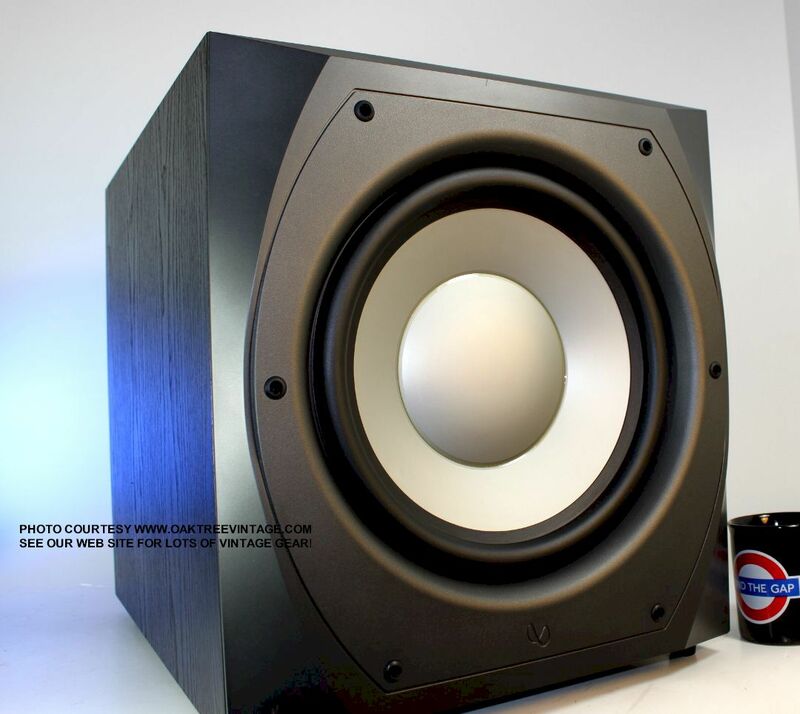 Great for home use or project studio monitors. If you can't afford the famous Yamaha NS-10's (now, currently north of $1000.00), then these may be an affordable alternative for your project recording studio (I used to be a dealer for NS-10's and have heard and sold many). We have completely tested them with both recorded material, PN 20-20k and swept them with our AF generator. Prior to testing with the sweep generator, we added gasket material under all the driver flanges in each cabinet to eliminate resonate vibrations. This is really a 'finishing touch' on this model of Yamaha's that should have been done at the factory, but is rarely done by most companies / manufacturers. We also added 'poly-spun' batting to the cabinet space to further tighten up the low-end, eliminate hollowness / cabinet ringing. Again, should have been done at the factory, instead of relying an 'empty cab' to allow 'boomy bass' which on the original sales floor, made the box appear sonically 'larger' than it is by making the box seem to be producing more bass. The 'bass' that an un-damped cabinet produces is 'hollow and flappy', and not what you'll want to listen to over the long haul. That would be come very fatiguing soon. Handles power decently and reproduced the low-end in our most difficult test CD! If you've read some of our other 'audition notes', you'll know what is meant when I say that these speakers, "reproduced the "TLC 'Sub-Bass' note' VERY well" when situated on the floor. - 3-Way, Acoustic Suspension design for studio monitoring "tight bass"
Here's a GREAT 'looking' pair of Infinity RS-225's (and looks are all these have going for them). These feature 'Gutless' / 'Flappy' bass with anemic power handling capability, and are quite likely one of the 'all around' WORST sounding speakers I have auditioned in the past 25 years! Our speaker tech has completely gone through and 'Certified' these. We have completely gone through these Infinity RS-225. Both woofers had their surrounds just replaced with new foam. 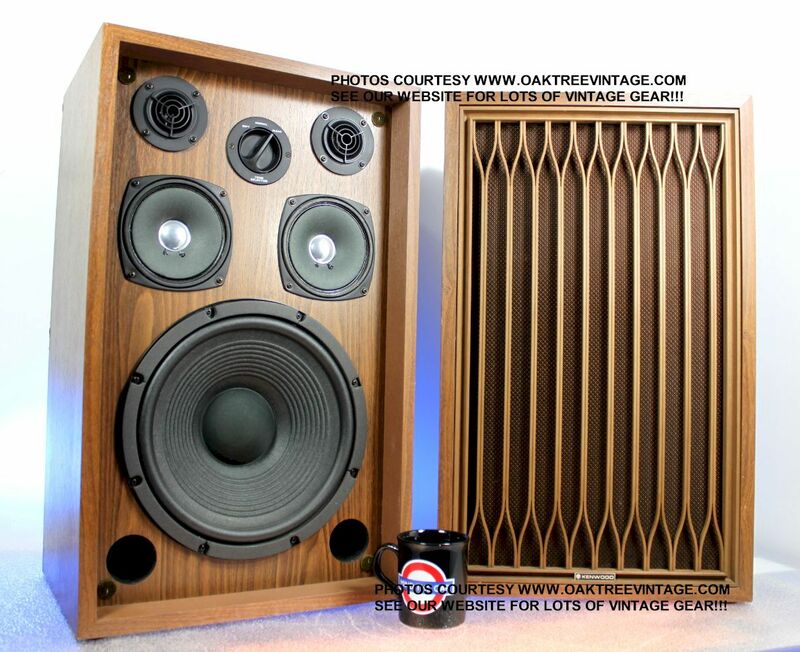 The Oak wood grain, vinyl wrapped cabinets in great shape, and the original black knit grills are in good shape. Grill frames perfect with no broken or repaired parts. Where would these be good? Maybe for background music in a doctors office or funeral home. It's a real shame too, as we just had a pair of RS-425's (the bigger brother to these) and they were amazingly GREAT performing speakers. Cabinets measure 14" H x 9" W x 8"D and weigh 11 lbs each. Includes our standard 90 day limited warranty (excluding problems due to under / over powering). To participate in our speaker survey, click here. 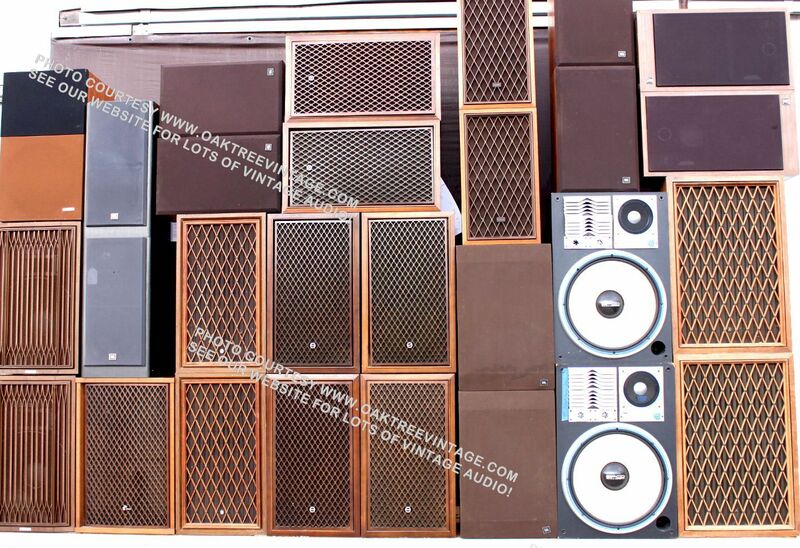 Wall of 'Vintage Speakers' we put together for one of our clients. 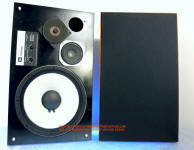 Consists of AR, JBL, Kenwood, Pioneer, Sansui and others. 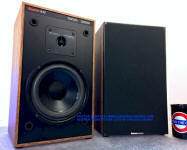 These are great 2-way speakers by Yorkville, the model YSM-1's. Two-way design featuring an 6.5" Poly woofer and a 1" Soft Dome tweeter. 2" tuned port for extended low frequency response. Input is via recessed, heavy-duty, binding / banana posts. Very solidly built cabinets, finished in black, vinyl wood grain. Grills are a black knit. The cabinets that are in great shape as are the original grills. Great sounding with sonic detail and balance. Great for smaller systems or for surround speakers. These are small "bookshelf" / wall-mount size speakers so their height and foot print is minimal. Our speaker tech has completely gone through and 'Certified' these. We have completely tested them including sweeping them with an audio generator looking for any acoustical anomalies or extraneous noises or sounds. The surrounds are in great shape and should last many more years prior to replacement. They look, work and sound great! Made in Canada! Each measures 16.5" high x 9.5" wide at the front x 9.25" deep and weighs 17 lbs unpacked. Includes our standard 90 day limited warranty (excluding problems due to under / over powering). 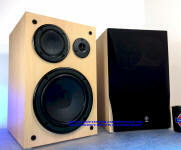 Super quality center channel speaker for higher-end surround sound AV systems. If you own one of those "all-in-one" box systems from one of the many "big-box / no-help" retailers, this is over-kill for you, but if you assembled your A/V system from more quality components, then here's a 'QUALITY' center channel speaker. The Infinity, model 'Video 1'. These are also great when 'paired' as stereo, 'front channel' speakers. Wedge shaped unit utilizes dual-6" drivers and a 1" tweeter. Our speaker tech has completely gone through and 'Certified' these. He just installed, fresh, new foam surrounds on both mid/woofers for trouble-free service. We have completely tested and "swept" with our AF generator. Box sounds great with no anomalies. Designed for horizontal placement as a center channel, but can be used vertically if utilized as stereo / front channel speakers. Sounds great and very clean cosmetically. Only cosmetic issues are some chemical staining around the dust caps from the re-foam process and a bit of 'candle wax' on bottom edge of the grill (not visible, unless you tip the speaker up and look underneath the grill). Very solidly built. Unit measures 18" wide x 7" tall in the front x 5" deep and weighs in at 14 lbs unpacked. Comes with our 90 day limited warranty (excluding problems due to under / over powering). X 6" D and weigh 5 lbs unpacked. Includes our standard 90 day limited warranty ( excluding problems due to under / over powering). 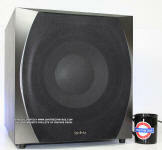 Another great performing powered subwoofer, the Infinity 'Entra Sub Two', 12", 'powered' subwoofer. This is a "HUGE" and SOLID sounding low-end box. Super tight bottom end and would have no trouble 'keeping up' with most any home audio system. ü Following ext / int visual inspection entire unit was cleaned inside and out. ü Entire subwoofer 'swept' with an AF generator to ensure sonic condition. ü Plate amplifier removed and inspected for any 'loose parts' (hey it's a subwoofer, and they do some 'vibrate'in'!). ü Level pot and 'roll-off' pot cleaned for static free performance. ü Plate-amp re-installed with gasketing material to completely seal edges and reduce any possibility of vibration (actually no sealant used in original build.?.). ü Both 'speaker level' and 'RCA' inputs and 'speaker pass thru' outputs tested. ü All functions tested for perfect operation. ü No power supply hum of any kind. It's dead silent! 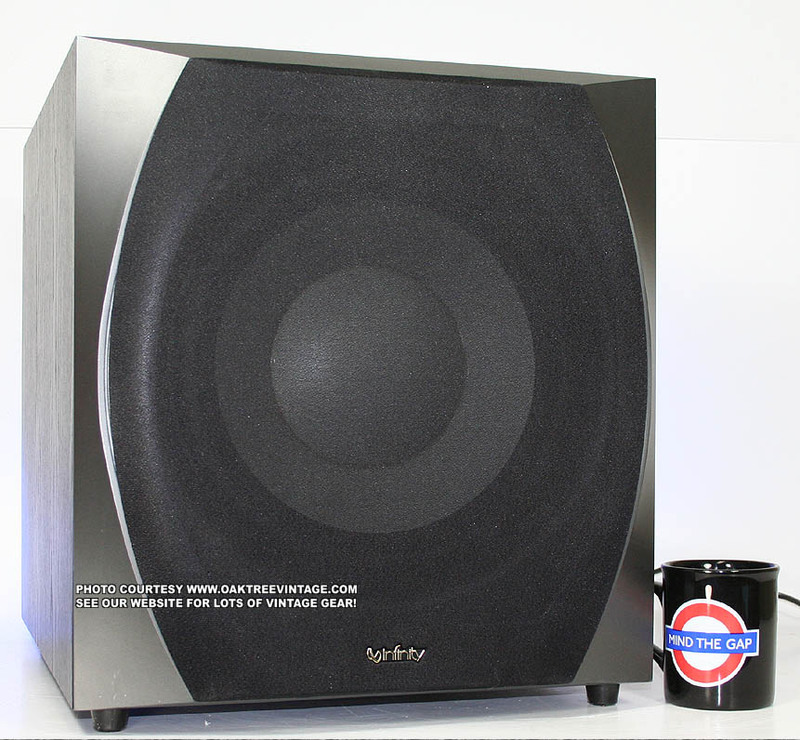 Great performing and sounding Infinity powered subwoofer, the Infinity 'Entra Sub Two'. Cabinet design: .75" thick, MDF construction. Again this is an incredible sounding sub. The satin black finish, wood grain cab in great, near new cosmetic condition. We will include a set of our 'Sorbothane' 'Iso-pods' for use if the purchaser so desires, which is how we auditioned it (as they originally come with 'hard, nylon' feet, which will likely be a source of vibration if used on a 'hard floor'). Again, this thing provides great low end presence that would add to most any home audio system. Measures 17" tall x 16" wide x 20.25" deep and weighs a HEAVY 45 lbs unpacked. Comes with our 90 day limited warranty (excluding problems due to under / over powering). 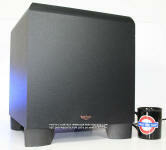 Another great performing powered subwoofer, the Klipsch KSW-10, 10", 'powered' subwoofer. This is a SOLID sounding low-end box. 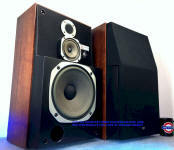 Super tight bottom end and would have no trouble 'keeping up' with most any 'mid sized' home audio / home theater system. ü Entire subwoofer 'swept' with an AF generator from 10Hz - 1kHz to ensure sonic condition. 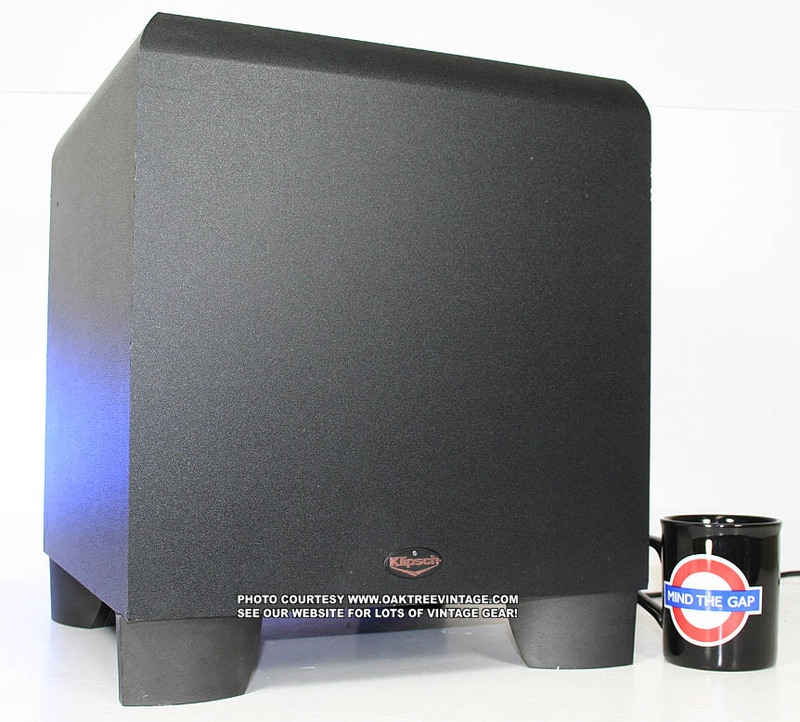 Great performing and sounding Klipsch powered subwoofer, the Klipsch KSW-10. 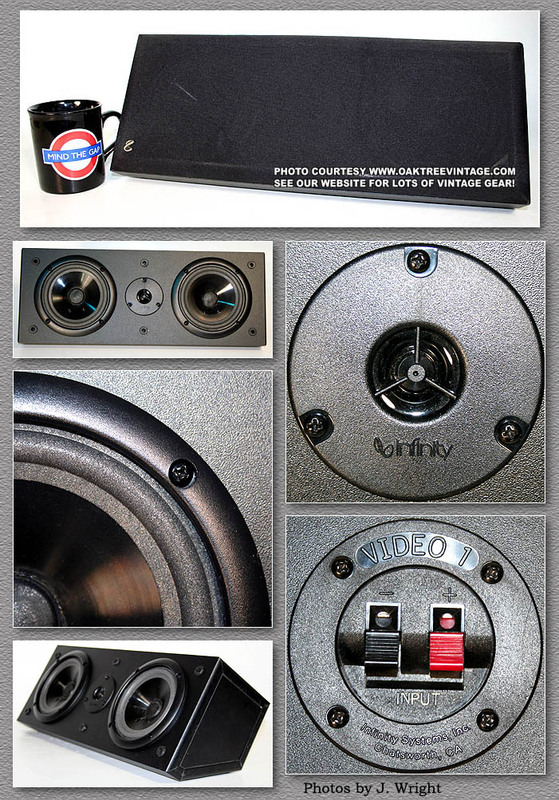 - Speaker level inputs, via 'Heavy Duty, 5-Way, binding posts for driving power amp if line level is not available. Cabinet design: .75"+ thick, MDF construction. Again this is an incredible sounding sub. The matte black finish, cab in great, near new cosmetic condition. We will include a set of our 'Sorbothane' 'Iso-pods' for use if the purchaser so desires, which is how we auditioned it (as they originally come with 'hard, nylon' feet, which will likely be a source of vibration if used on a 'hard floor'). Again, this thing provides great low end presence that would add to most any home audio system. Measures 15.5" tall x 13.5" wide x 13.5" deep and weighs a 30 lbs unpacked. Comes with our 90 day limited warranty (excluding problems due to under / over powering). "Are Equalizers really necessary? I just paid $30 grand for my speakers. They shouldn't need any EQ. Right!??" Short answer is probably yes, an EQ will generally be beneficial to most systems. Most speaker designers strive to make a speaker's curve as "flat"* as their projected size parameters and target retail price will allow. The human hearing curve is not "flat". Most folks' hearing is accentuated in the midrange (it's where the human voice is centered) and attenuated in the bass and treble. Sort of a reverse "rock-n-roll smile" curve. When you hear a good, "flat" response speaker, it will likely appear to have an over abundance of mids, at least for most listeners. It will also likely have a deficiency in bass and possibly treble. It will most likely sound "thin", the degree of which can vary from slight to extreme, depending again, on many variables. This might not even be readily apparent when auditioning speakers, but generally if you hear a pair speakers with an appropriately adjusted, EQ engaged, then you listen to it bypassed, you will want to re-engage it as quickly as possible. 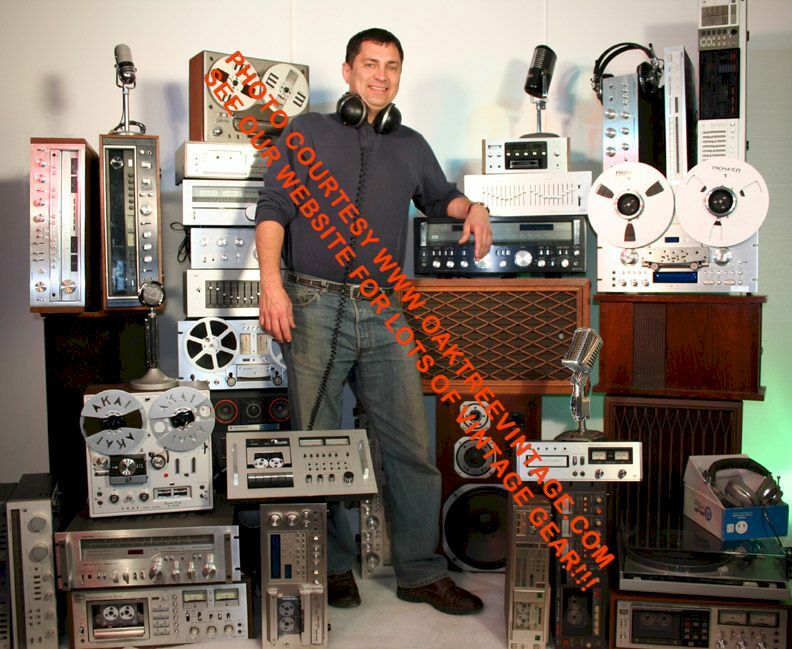 CLICK HERE TO SEE OUR SOLD / ARCHIVED SPEAKERS. WE WILL LIKELY GET MORE OF THEM AGAIN!!! Our speaker tech has completely gone through and 'certified' these. Tweeter diffusion foam replaced. All drivers were removed and reinstalled into cabinet with ‘added’ gasketing material under their frames to further reduce any possibilities of vibration or acoustic anomalies. 'High' and 'Mid' Attenuators checked for functionality (these attenuators have wipers that go 'a bit too far', thus go past their coils at 100% rotation, so for 100% signal, adjust to extreme 'clockwise', then back them off 1-2mm). The tweeters have new dispersion foam installed. Grill front frames re-covered and look fabulous (while not shown in the above photos, the "JBL" logo badges are intact on the frames). Next, as always they were tested with both recorded material, PN 20-20k and swept them with our AF generator from 20-3kHz. Then came our standard, 'abusive' test recordings. New, REAL Walnut wood veneer professionally installed. Cabinets were finished off with a coat of ‘Lemon Oil’ and then hand-rubbed with ‘Feed-n-Wax’. The front corners and edges are all nice and crisp with virtually no wear. They look NEARLY NEW! The Boston A40's. These have always been one of our favorite "book shelf" speakers. I sold these for years as a Boston dealer and always knew my customers would be more then pleased with them, when properly qualified. I also purchased new, and utilized a pair of original series Boston A40's in my home studio as "mix-down" monitors for years. Very accurate 2-way design reproduces very nice detail in the audio spectrum without being too anemic (an issue with many 'smaller speakers). Our speaker tech has completely gone through and 'Certified' these. He completely tested all drivers. He replaced the 'deteriorated' original foam gasketing material with fresh, new foam surrounds for years of trouble-free service. To reduce any possibilities of vibration or acoustic anomalies he added new gasketing to eliminate vibrations and sonic anomalies. Felt feet were installed to the bottom plates. Next, as always they were tested with both recorded material, PN 20-20k and swept them with our AF generator from 1Hz-3kHz. Then came our standard, 'abusive' test recordings. Cosmetically, the grills were cleaned & the cabinets and grills are in great shape. Slight scratches you can 'feel' with your hand on the sides, but can't notice them visually. Nothing distracting at all. These are in great looking and sounding condition. Cabinets are dark, oak grain vinyl wrap. Again, as stated above, we have just installed fresh, new foam surrounds on the woofers for years of trouble-free service. We completely tested them including sweeping them with an audio generator looking for any acoustical anomalies or extraneous noises or sounds. Great balance and very pleasing to listen to. Each measures 13.5" H x 8.25 W" x 7.75" D and weighs 9 lbs unpacked. Includes our standard 90 day limited speaker warranty ( & excluding problems due to under / over powering). 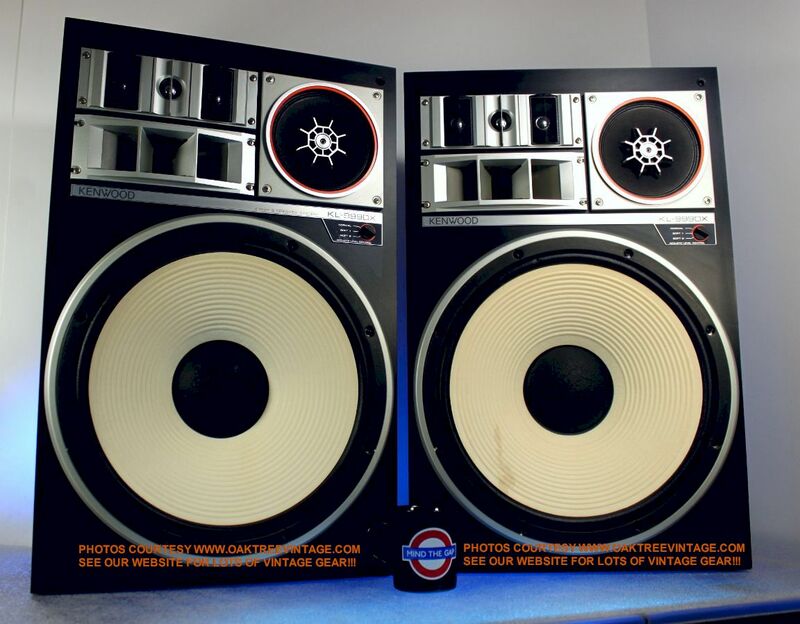 These are from an upper-end line of speakers that Technics produced for MCS. The "Linear Motion" line used a Tri-Planer baffle board design to more correctly "time align" the 'top end' drivers with the woofer. The Midrange is on a 'spacer' to position it (time-wise) between the tweeter and woofer. This design was based on the Flagship (and very expensive) Technics SB-7070 speakers. 'WESTERN ENVIRONMENT SPEAKERS SO NO 'HIGH HUMIDITY' CABINETS'! All drivers were removed, tested individually. 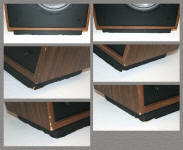 The tweeter diaphragms were replaced with 'Bob Crites', 'Titanium' diaphragms. The original crossovers were also removed and entirely replaced with 'Cedar Planked' Bob Crites crossover networks, and an upgraded internal wiring harness to the drivers. New, thick gasket / sealant material was added to all driver mounting flanges, prior to re-installation, as well as the input panel to the mounting surfaces, to eliminate any possibilities of vibration, air leakage or acoustic anomalies that can be allowed with the 'anemic' foam rubber gasket installed at the factory. Poly-Spun batting added to minimal existing damping material to 'tighten up bass response' and reduce cabinet 'ring'. Cosmetically the cabinets were cleaned, coated in Restore-A-Finish, followed with Lemon Oil, and look fabulous with only a very minimum of wear (see photos above). The real, walnut wood, veneer looks great, with lots of well defined and 'book matched' grain. You can't get walnut grain like this for the past couple dozen years. Both grills in perfect 'structural' shape as is the original, terry / knit cloth. All 'magnetic' fasteners in place as are the original logos. Felt feet were installed to the cabinet bottom plates. Next, as always, they were tested with both recorded material, PN 20-20k and swept them with our AF generator from 5Hz-5kHz. Even following their upgrades / tech work, I found a couple 'sonic anomalies' that needed to be corrected prior to listing. We auditioned this pair extensively and 'THEY DELIVERED' beyond what was expected. The 'bass' is not only completely solid and tight on these speakers, but goes VERY DEEP. Handling power from our 'more than adequate' power amp FLAWLESSLY up to 'painful levels'. Worth noting, these have spent the past couple of decades in 'The West', where the humidity is generally less than 30% (usually WAY less), so the cabinets and veneer has acclimated and dried out well. They've settled well, with no issues. 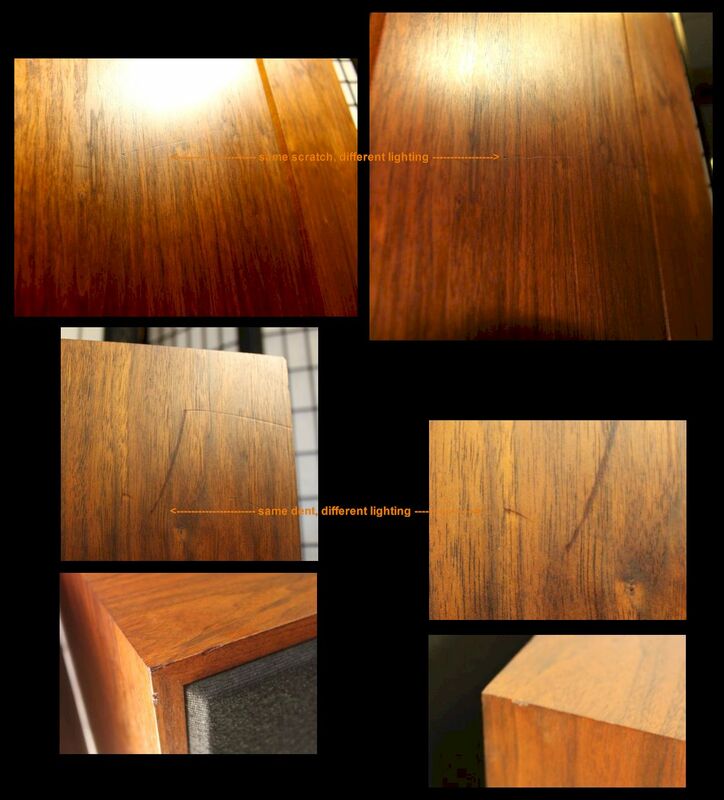 No need to worry if speaker cabinets from more 'humid' (read Florida, and most of the Southern / South-East Coastal states) environments will shrink and have joints open up, or veneer start to split and separate. Donald Fagens, "I.G.Y." from the album "Night Fly" "solid and snappy"
Van Halens' cut "Drop Dead Legs" and "Hot for Teacher" from the CD "1984" ROCKED! YAZ" "Punchy, snappy and solid"
Malcom Arnolds, "The Padstow Lifeboat" from our 'Tutti' Reference Recording; "great balance, and a wide sound-stage"
Mussorgsky-Ravel's, "Baba Yaga; Great Gate At Kiev" from "Pictures At An Exhibition" , again, from our 'Tutti' Reference Recording; "was HUGE and a very 3-D feel'"
'Friday Night in San Francisco', with Al Dimeola, John McLaughlin and Paco DeLucia, "WOW!! !...was fabulous at about 'half volume' on the Hafler DH-500"
Incredible power handling characteristics for a speaker this size. They are able to handle "power" MUCH better than your average speaker. Not simply referring to their wattage rating, but just the way they perform at higher power / volume levels without "falling apart" sonically. We 'stood' on them HARD with our test Hafler 500 Watt power amplifier. 'Solid', punchy and 'tight' low-end, with no, I repeat, NO 'mush'. Again, we have completely gone through these, and afterward, each was AF swept from 5000 Hz all the way down to 5 Hz! Interestingly in doing this we did find a 'spider wire' touching the spider on one woofer. That is just one of the things that without doing an AF sweep, you wouldn't likely have found and might never have been rectified. These speakers ROCK!!! (and no, I don't just mean they excel at "rock". Just re-check the list of demo pieces listed above. Our speaker tech has completely gone through and 'Certified' these. Tested for all frequencies with a sweep generator and PN. We also cleaned and burnished the contacts on the, 'always oxidized on vintage speakers', attenuators for distortion / drop-out free performance. 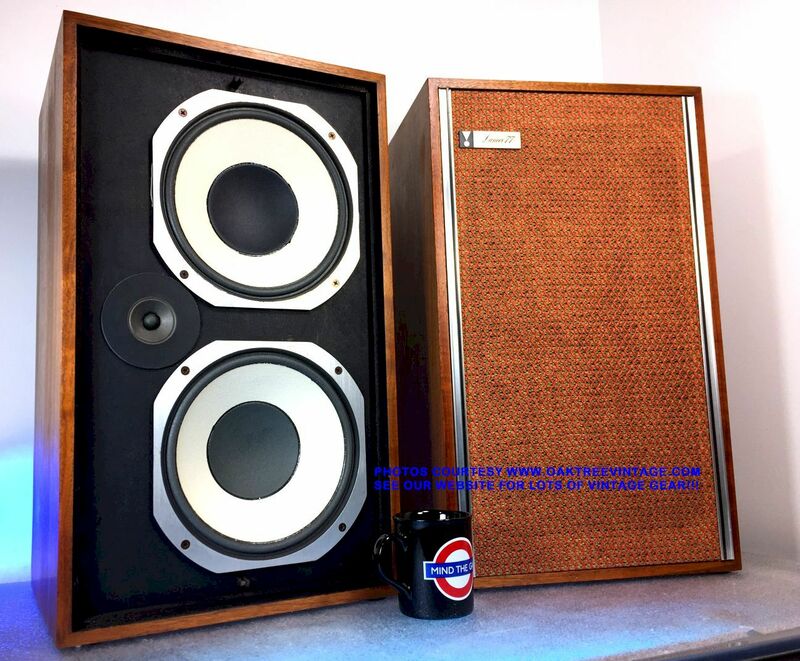 Our speaker tech also removed all the drivers, and as on most of our refurbished speakers, he added gasket material under all drivers that were not already adequately sealed and seated, and the rear panel to eliminate any resonance and further seal cabinet. Speakers were completely 'detailed' inside and out. Cabinets received a coat of 'Restore-a-Finish' and a coat of 'Feed-n-Wax' to bring out their original luster. Grills were cleaned with brushes and compressed air and look great. No breaks to the original 'Kumiko' lattice work. We auditioned this pair extensively and the delivered very well. Additionally adding the 'gasketing' really 'tightened' up the cabinets and cleaned up the bass response. YAZ" "was Punchy, snappy and solid"
Surprising power handling characteristics for a speaker this stature (vintage / system intention). They are able to handle "power" MUCH better than your average speaker. Not simply referring to their wattage rating, but just the way they perform at higher power / volume levels without "falling apart" sonically. We 'stood' on them fairly strong with our test Hafler 500 Watt power amplifier. 'Solid', punchy and 'tight' low-end, with no 'mush'. Classic lattice grill, vintage look Sansui SP-1500 stereo speakers. Solid performers. 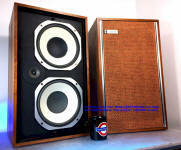 Vintage & VERY large Kenwood KL-999DX stereo speakers. 5-Way, Bass Reflex cabinet design. These are VERY efficient speakers with above average tone balance for 1980's speakers. Plenty of top end that can be filtered / tailored to your tastes with built-in attenuator or external EQ / tone control. Also HUGE & tight low end, likely due to the ported and very 'tuned' cabinet design. They also seem to be able to handle "power" better than your average speaker. Not simply referring to they're wattage rating, but just the way the perform at higher power / volume levels without "falling apart" sonically. Our speaker tech has completely gone through and 'Certified' these. All drivers were removed and tested individually. Attenuators / L-pads cleaned for 'intermittent free' performance. Poly-Spun batting added to existing damping material to 'tighten up bass response' and reduce cabinet 'ring'. Gasket / sealant material was added to all driver mounting flanges, prior to re-installation to reduce any possibilities of vibration or acoustic anomalies. There are no grills included with this particular pair. Cosmetically, cabinets were cleaned & the wood grain, vinyl wrapped finish is in decent shape with only minor, typical nicks and scuffs. 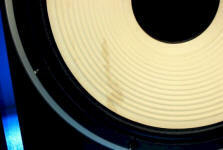 One of the Ivory colored woofer cones has a 'yellowish' stain (see photos above). Felt feet were installed to the cabinet bottom plates. YAZ" "was Punchy, snappy and solid, but could use an EQ to open up the vocals"
Just about anything from "KORN" "ROCKED!!! Bass and kick drum from their version of "Word Up" was HUGE and almost 'painful' with no faultering"
Linkin Park’s Guitars from “Hybrid Theory” ROCKED!!! VERY PHAT!!! Van Halens' cut "Top Jimmy" from the CD "1984", ROCKED! Kick and bass VERY solid! Cymbals 'up-front'. Guitar very phat! "Drop Dead Legs", Cowbell 'up-front'. Michael Anthonys bass was HUGE! Incredible power handling characteristics for a speaker this size. They are able to handle "power" MUCH better than your average speaker. Not simply referring to their wattage rating, but just the way they perform at higher power / volume levels without "falling apart" sonically. We 'stood' on them HARD with our test Hafler 500 Watt power amplifier. 'Solid', punchy and 'tight' low-end, with no 'mush'. 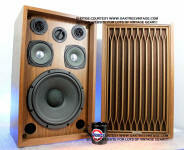 - 6.5" Non-deteriorating, paper surround Mid w/ "Thermal Radiator"
Very nice looking wood grain, vinyl wrap cabinets with only a few, minor 'battle scars'. Again, as stated above, this pair does not include grills, and there is the 'yellow splotch' on one of the woofers (see photos above). All drivers are in perfect condition, work and sound fine! Tested for all frequencies with a sweep generator. Speakers look fine (except for the above mentioned grill issue) and sound GREAT! 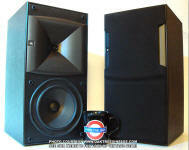 Huge, accurate and loud sound, but also very efficient at lower powers due to their 98dB rating! If you're looking for a great performing speaker at medium to higher volume applications, you will not be disappointed with these speakers. These things ROCK!!! Each measures 27.25" tall x 17.5" wide x 10.75" deep and weighs 44 lbs unpacked. This pair comes with original boxes. Can include a pdf download of the 1983 & 1984 original Kenwood Brochure / full line catalog of Stereo Gear. Our speaker tech has completely gone through and 'Certified' these. Tested for all frequencies with a sweep generator and PN. We also cleaned and burnished the contacts on the, 'always oxidized on vintage speakers', attenuators for distortion / drop-out free performance. Our speaker tech also removed all the drivers, and as on most of our refurbished speakers, he added gasket material under all drivers that were not already adequately sealed and seated, and the rear panel to eliminate any resonance and further seal cabinet. Speakers were completely 'detailed' inside and out. Cabinets received a coat of 'Restore-a-Finish' and a coat of 'Feed-n-Wax' to bring out their original luster. Grills were cleaned with brushes and compressed air and look great. No breaks to the original 'Kumiko' lattice work. Next, as always they were tested with both recorded material, PN 20-20k and swept them with our AF generator from 20-3kHz. Then came our standard, 'abusive' test recordings. These speakers are ready to go! We auditioned this pair well. Following the above mentioned 'barrage', our demo cuts ran the gamut from Dire Straits, 'Brothers in Arms', TLC 'Fan Mail', Allison Kraus and Union Station, Nickelback, a digital recording of a cathedral pipe organ, and a few others, all digitally recorded and some 'DDD'. Classic lattice grill, vintage look Sansui SP-2000 stereo speakers. Solid performers. Feature 4-Way, 6-Driver design. Our speaker tech has completely gone through and 'Certified' these. Tested for all frequencies with a sweep generator and PN. We also cleaned and burnished the contacts on the, 'always oxidized on vintage speakers', attenuators for distortion / drop-out free performance. Our speaker tech also removed all the drivers, and as on most of our refurbished speakers, he added gasket material under all drivers that were not already adequately sealed and seated, and the rear panel to eliminate any resonance and further seal cabinet. Grills were cleaned with brushes and compressed air and look great. No breaks to the original 'cathedral' lattice work. I have to add a note about these speakers. I read a few 'opinions' out there on this speaker a few months ago, before we started their refurbishment / restoration. I read some questions from folks that were thinking of purchasing them, or had purchased them and were wondering whether to spend their time to restore them. I read the follow-up 'threads, opinions, blogs, or whatever they're called' from respondents wanting to offer their "two-cents" worth (and in retrospect, they 'overcharged' by about 'two-cents'). None of the 'opinions' about them were from anyone who actually owned them or had heard them!!! And I'm not just talking about 1 or 2 'opinions', but numerous responses. Overwhelmingly the responses were something like, "oh, that's a 12" woofer and / or the box is too small", or "oh, that speaker won't have any bass response, cause it's from the 1970's, or it's from Kenwood, or it's from Japan, or it's...blah, blah, blah". Once we restored and tested them, we were 'floored by their bass'!!! Those opinions are laughable. Not one of the respondents actually owned or had heard them, but they all had their opinion saying how 'gutless' they would be. Well, you know what they say about "opinions" and we've all got one. Bottom line is these speakers have 'Bottom End'. PERIOD! 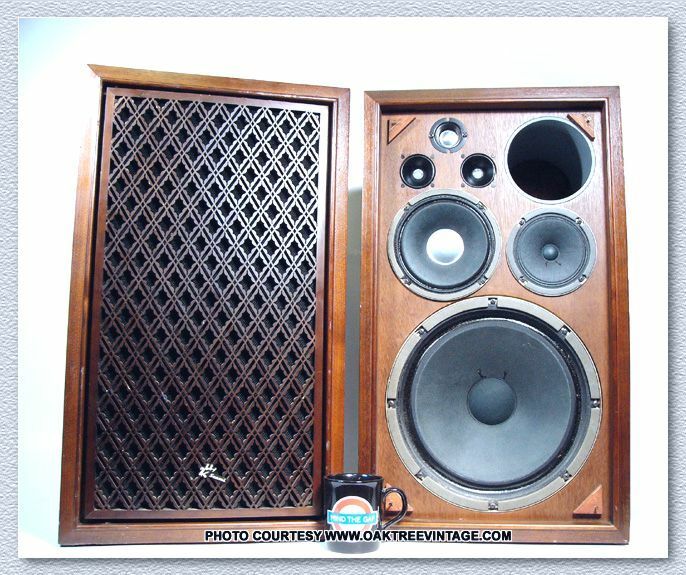 Fine power handling characteristics for a speaker this stature (vintage / system intention). They are able to handle "power" well enough. Not simply referring to their wattage rating, but just the way they perform at higher power / volume levels without "falling apart" sonically. We 'stood' on them fairly strong with our test Hafler 500 Watt power amplifier. 'Solid', punchy and 'tight' low-end, with no 'mush'. 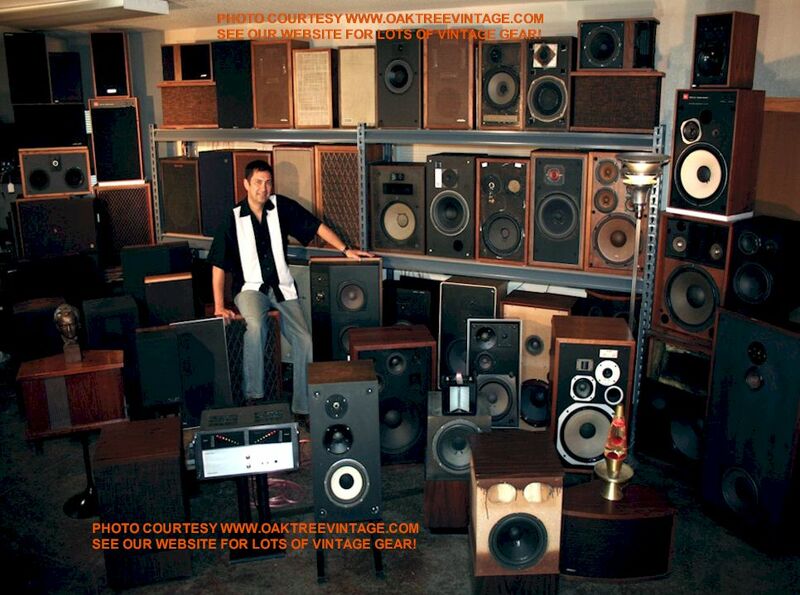 "So what makes Oak Tree Vintage such an 'expert' on speakers?...Seems like 'just a bunch of opinion' to me." Well it is 'just opinion', but it's based on 30+ years of 'well traveled and well rounded, listening experience' with speakers marketed from $20 to $200,000.